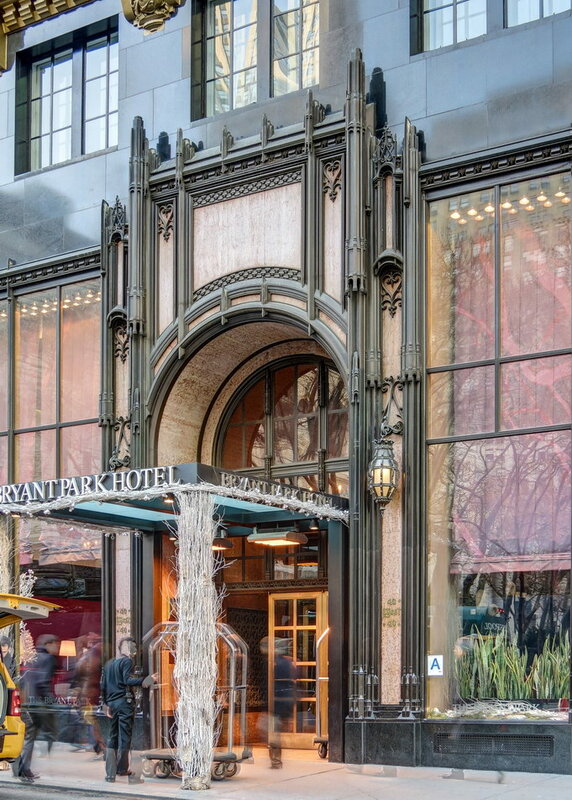 March 2, 2015 Manhattan1924, 40 W 40th Street, American Standard Building, Andre Fouilhoux, Art Deco, Bryant Park Hotel, Gothic, historic, hotel, landmark, Manhattan, midtown, New York City, Raymond Hood. 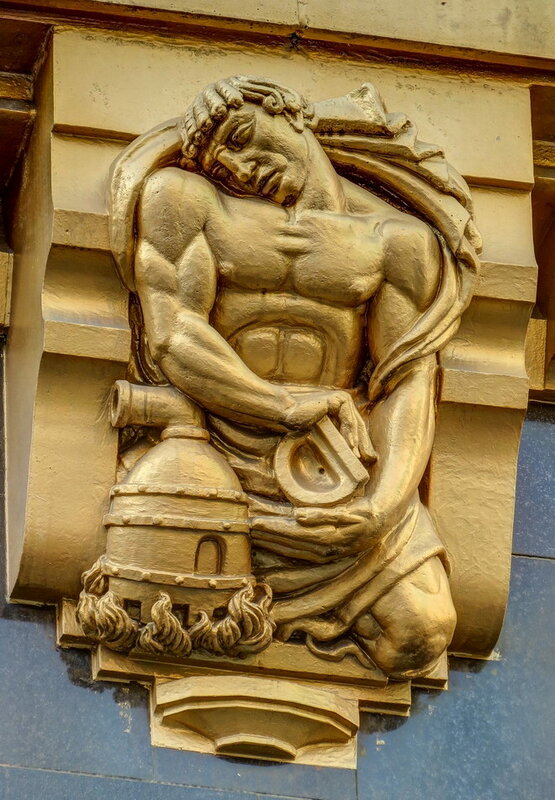 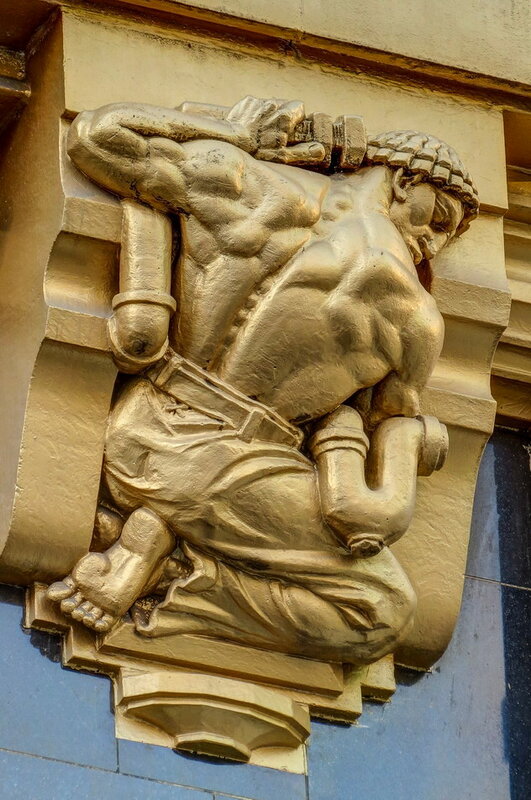 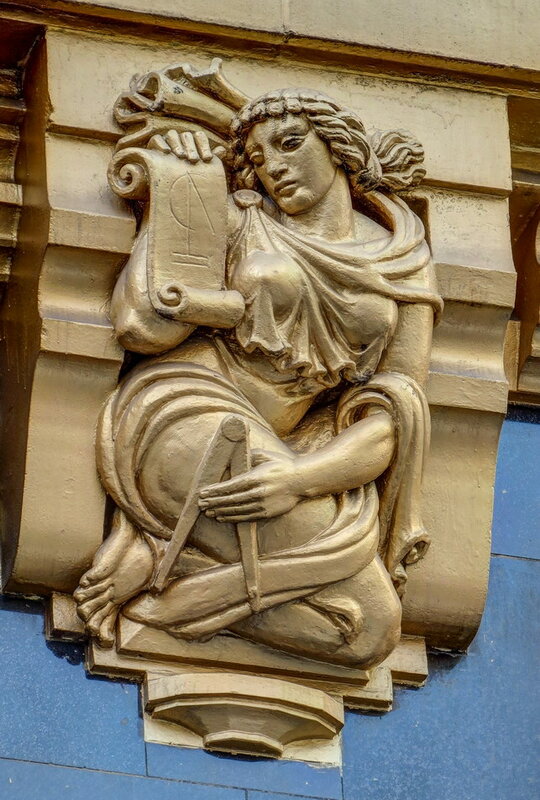 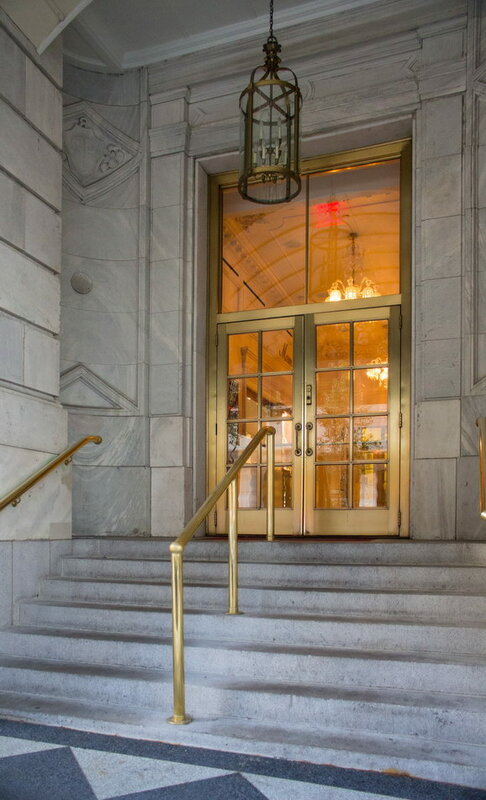 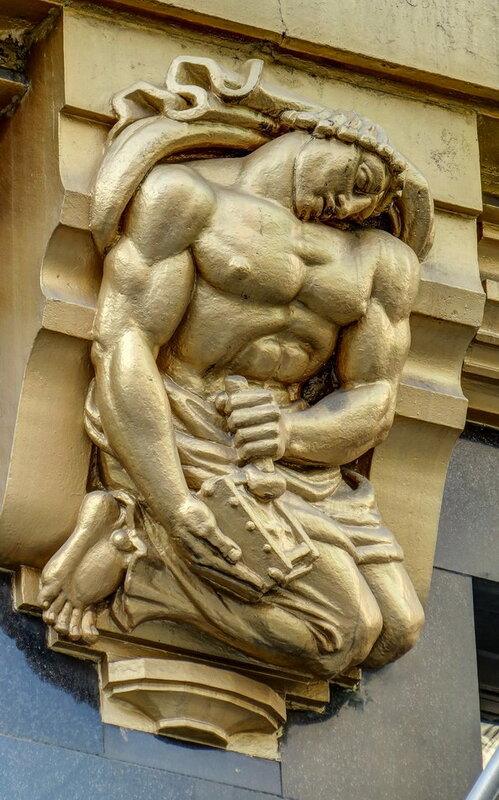 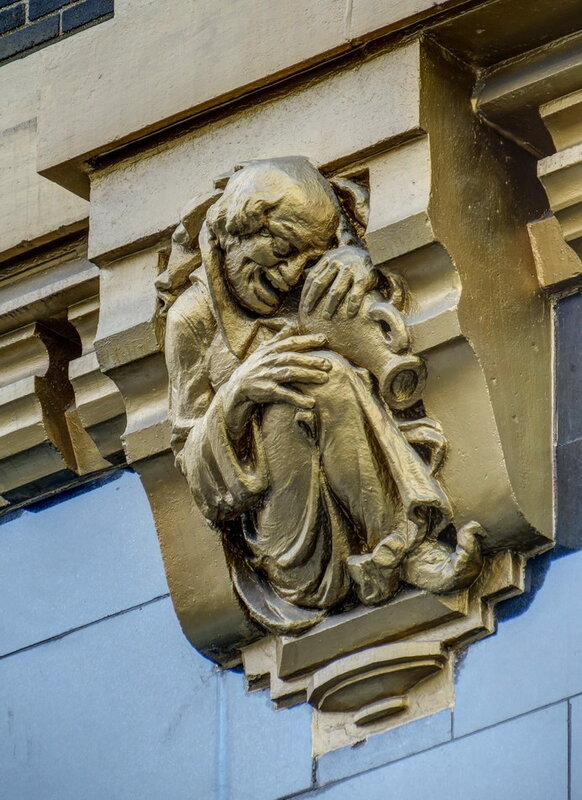 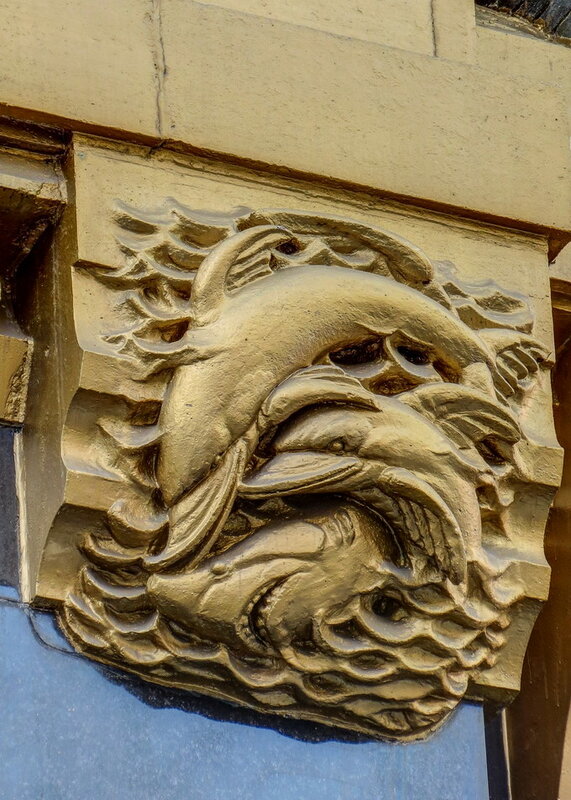 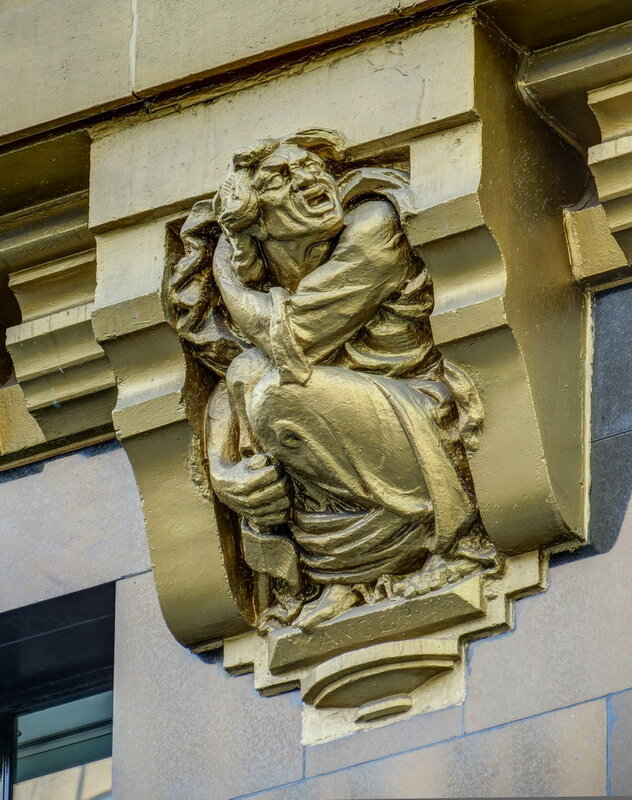 Passers-by are probably puzzled by the industrial-strength gilt-painted chimerae on Bryant Park Hotel – if they even lift their eyes to the third floor level. 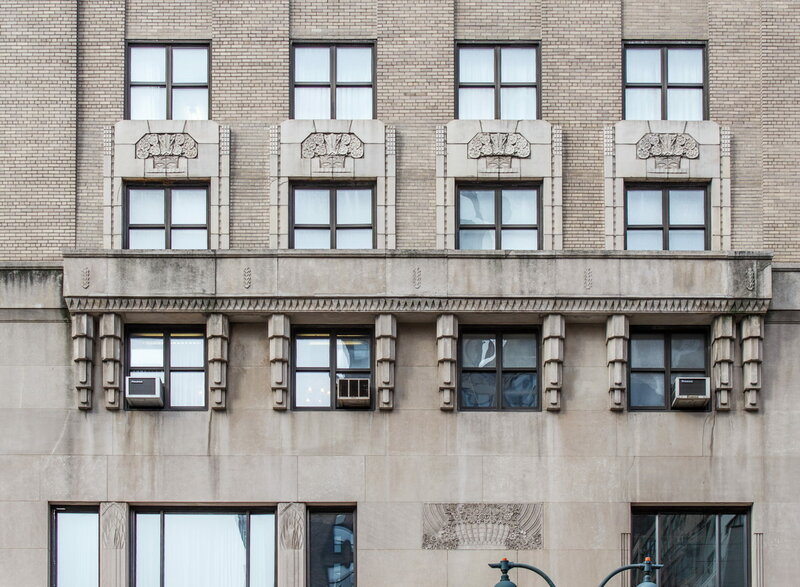 But the figures make perfect sense in the context of the facade’s original owners, American Radiator and Standard Sanitary Company. 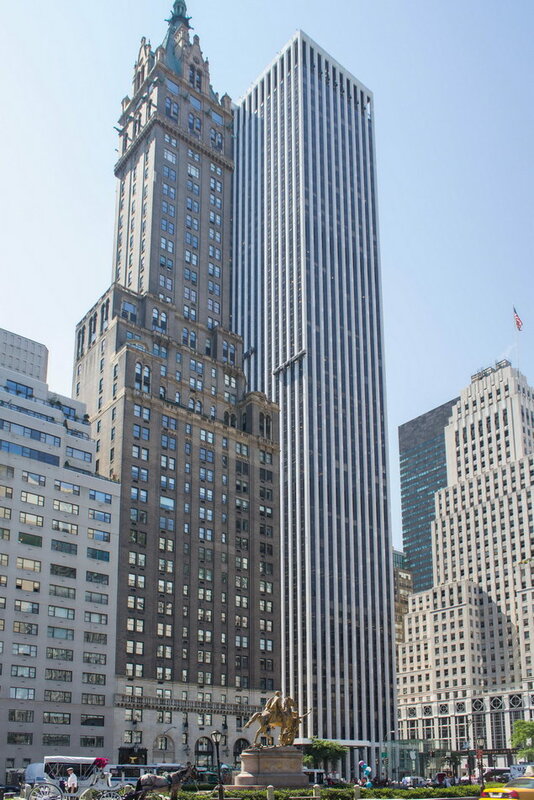 Originally, this was the American Radiator Building and later known as the American Standard Building. 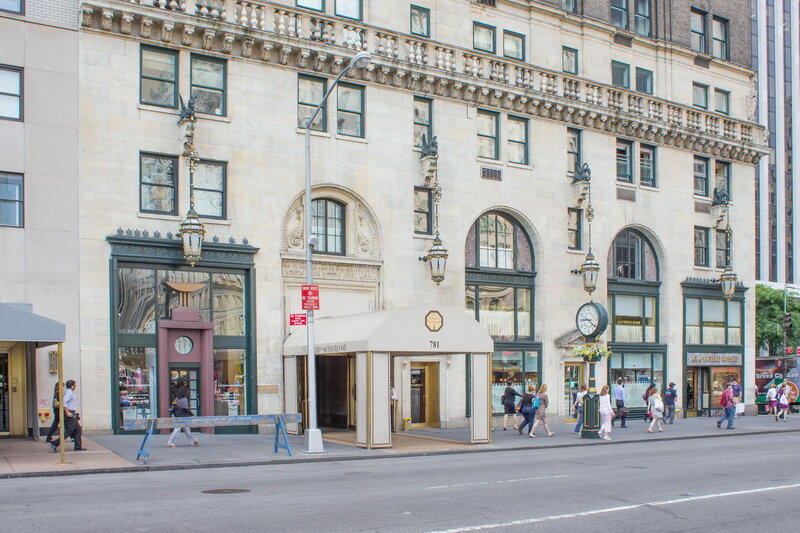 The ground floor initially contained showrooms for the company’s bathroom fixtures. 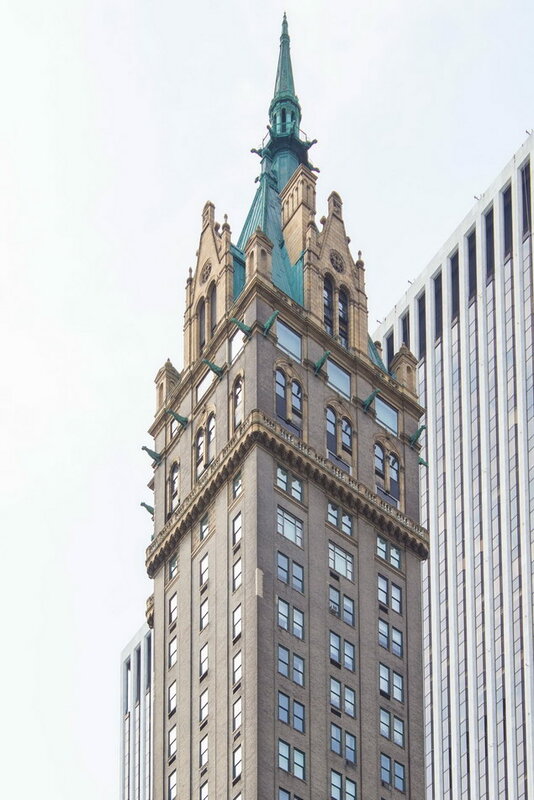 According to the Wikipedia article, the building is based on a design submitted for the Chicago Tribune building. 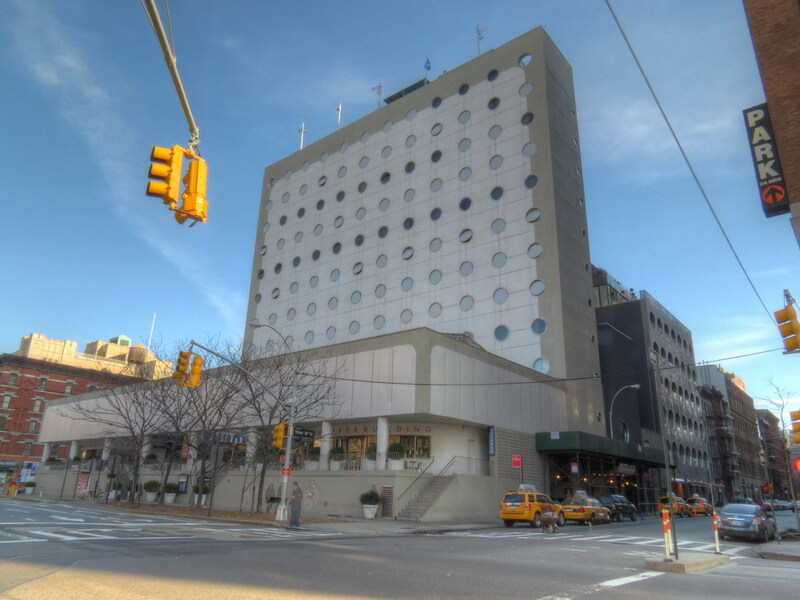 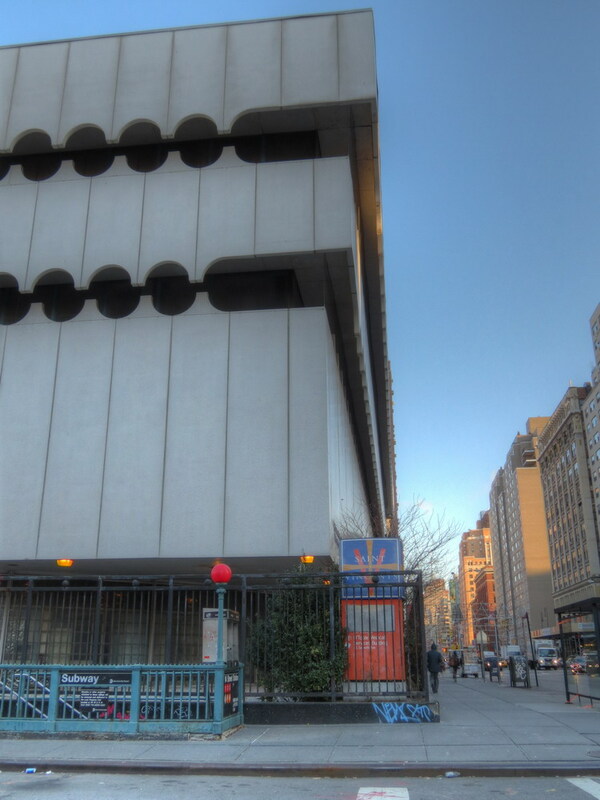 The building was converted to a hotel in 2001; it has New York City landmark status, and is listed in the National Register of Historic Places. 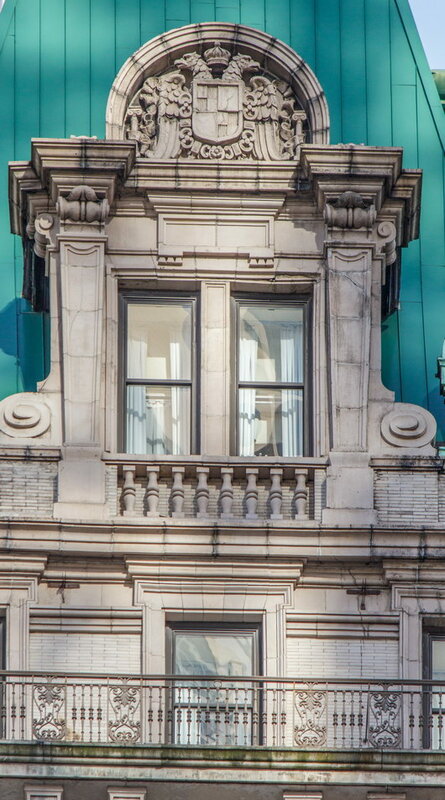 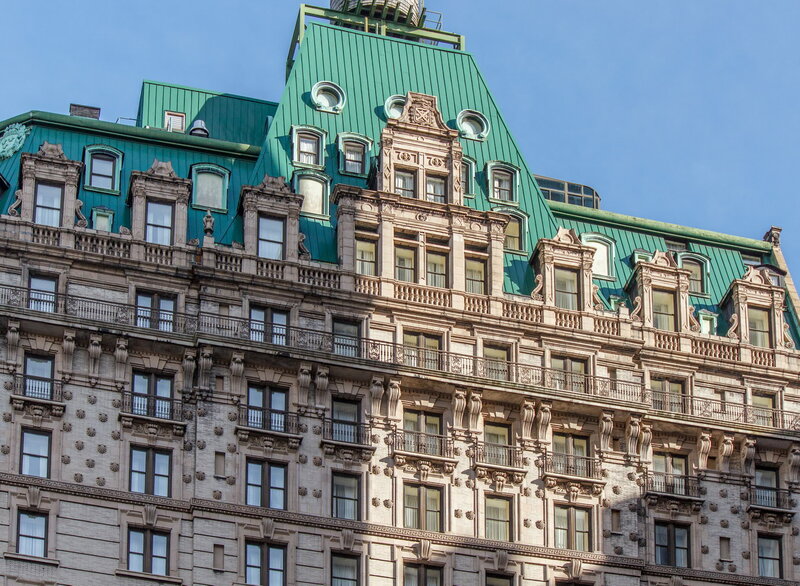 February 23, 2015 Manhattan1927, 751 Fifth Avenue, Buchman & Kahn, French Gothic, french renaissance, historic, hotel, landmark, Manhattan, New York City, Shultze & Weaver, ues, upper east side. 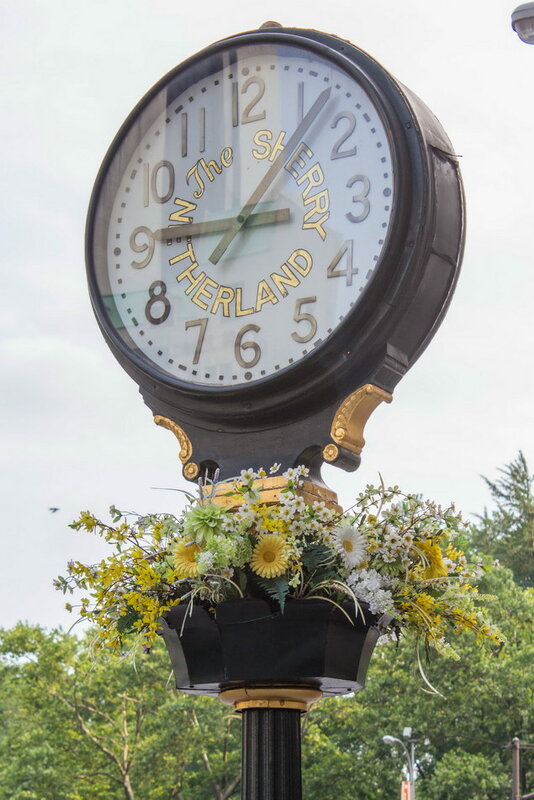 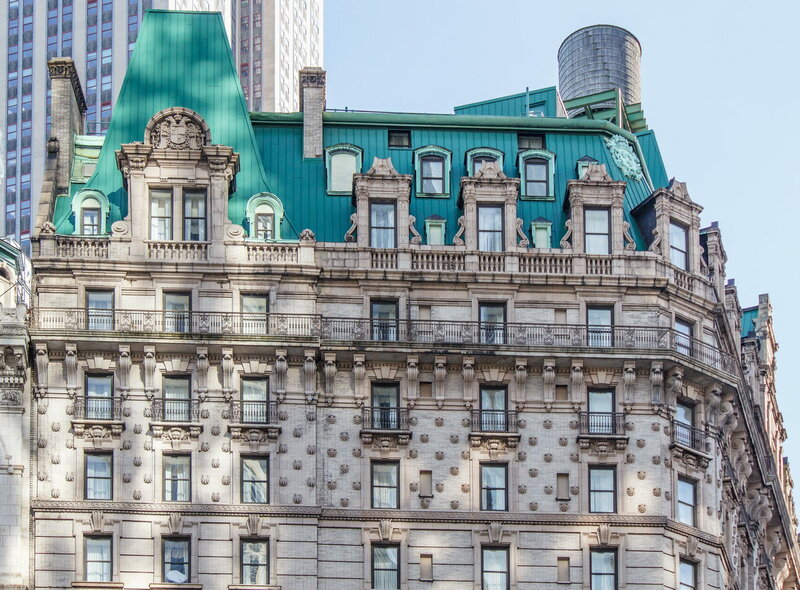 The Sherry Netherland is not, oddly enough, a New York City landmark unto itself (although the clock in front of the hotel is – go figure); it is part of the Upper East Side Historic District, along with the Hotel Pierre, Metropolitan Club, and other classics. 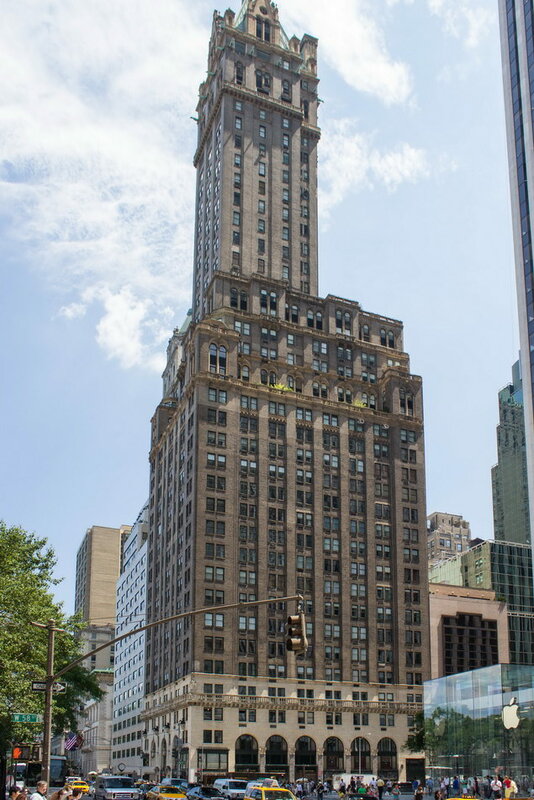 The 40-story building was the tallest apartment-hotel in New York when built, in 1927. 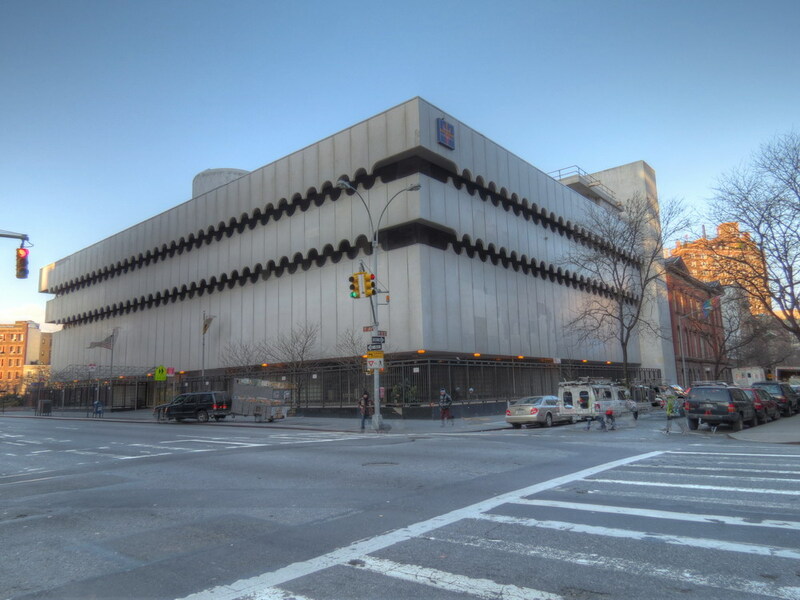 The structure’s design was a collaboration of New York-based architects Shultze & Weaver and Buchman & Kahn. 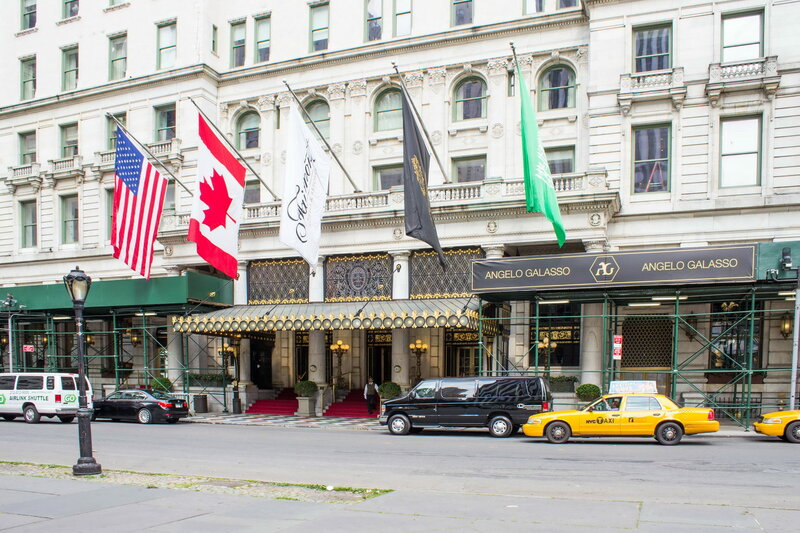 Shultze & Weaver specialized in luxury hotels such as the Pierre and Waldorf-Astoria. 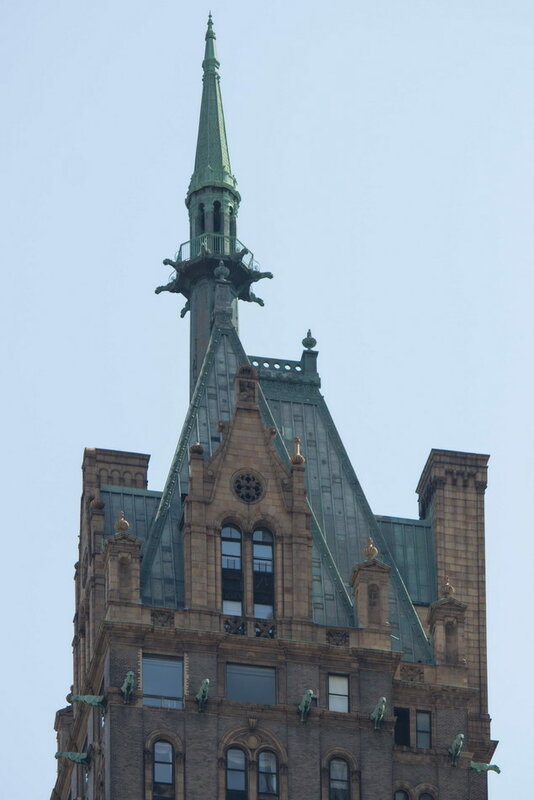 The French Gothic/French Renaissance tower is among New York’s most distinctive spires, hiding a water tank above the gargoyles. 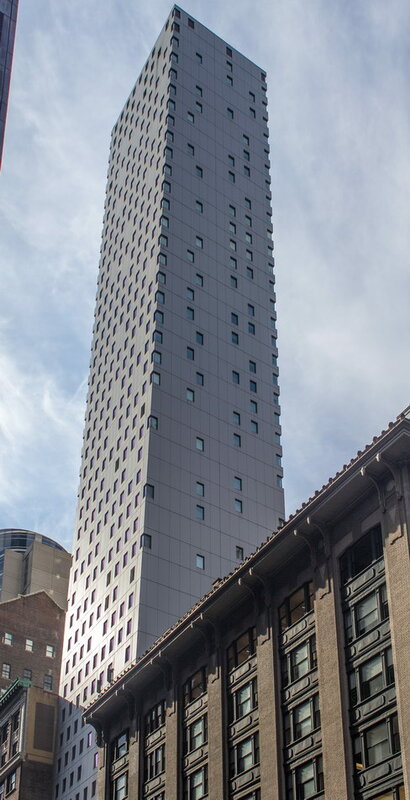 There is an observation platform at the very top – though you’d have to be brave and a climber to reach it! 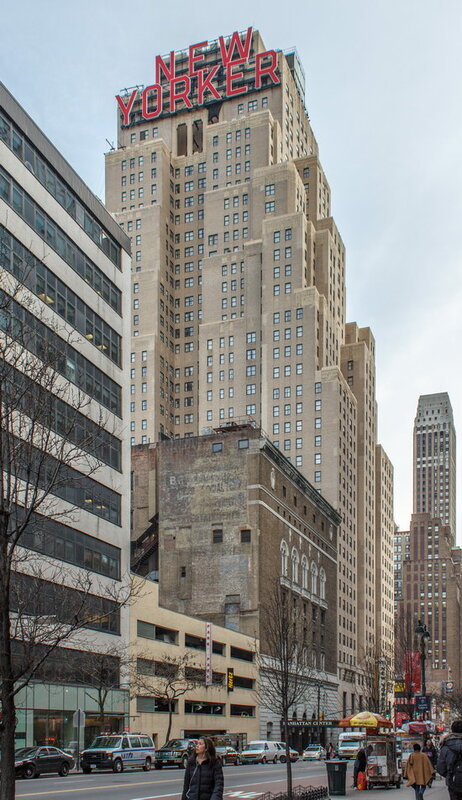 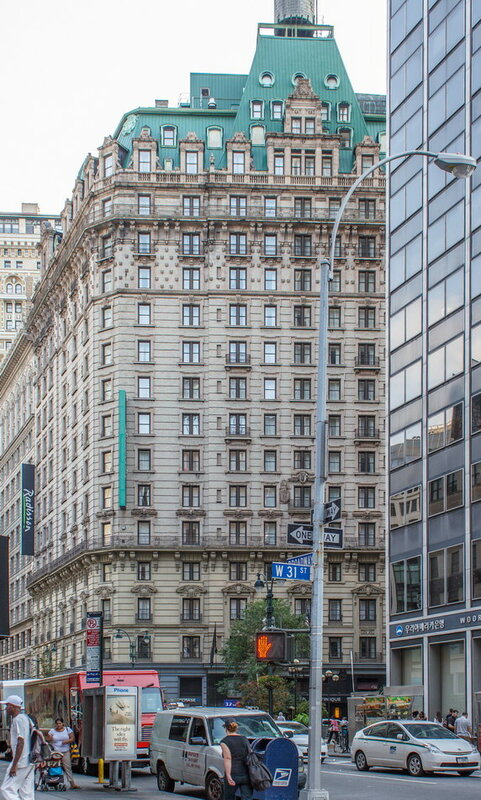 While the Sherry Netherland’s public personna is a hotel, it has only 54 rooms and suites; 165 co-op apartments make up the bulk of the building. 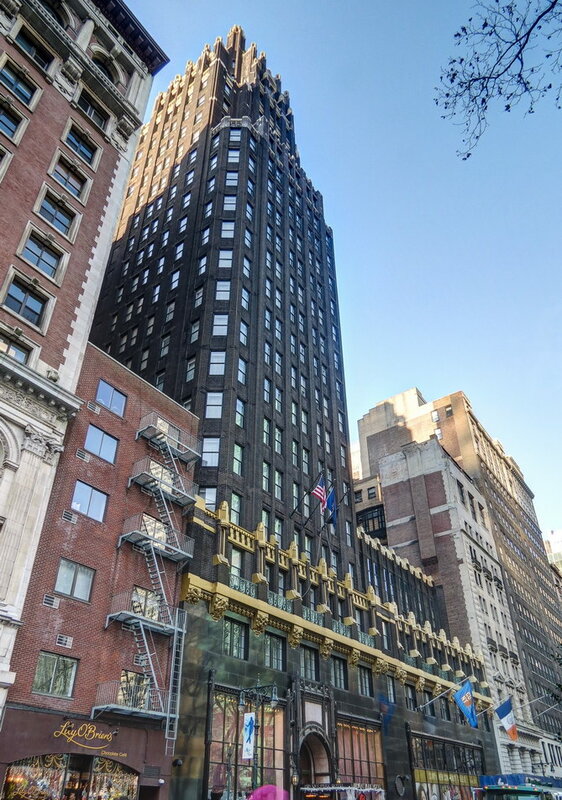 February 23, 2015 Manhattan1909, 1921, Henry Janeway Hardenbergh, historic, hotel, landmark, luxury, Manhattan, midtown, New York City, Second Empire Baroque, Warren & Wetmore. 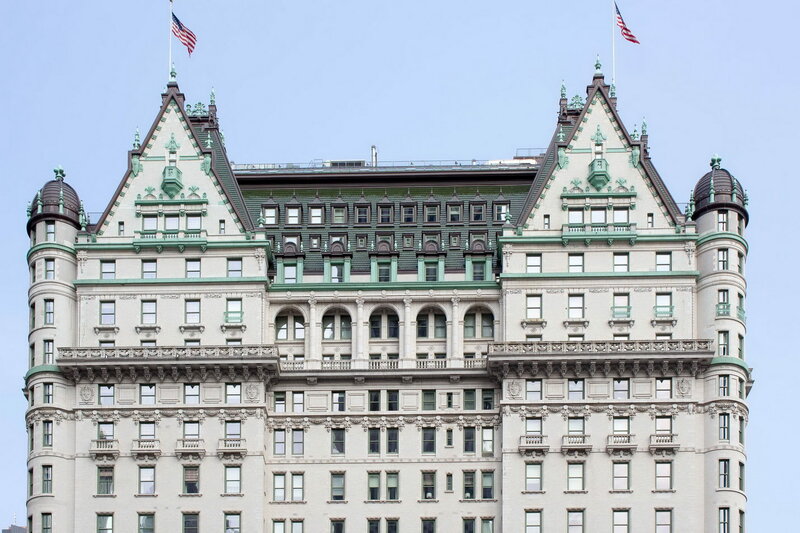 The century-old Plaza Hotel has changed hands several times, but it remains an architectural – and hospitality – landmark. 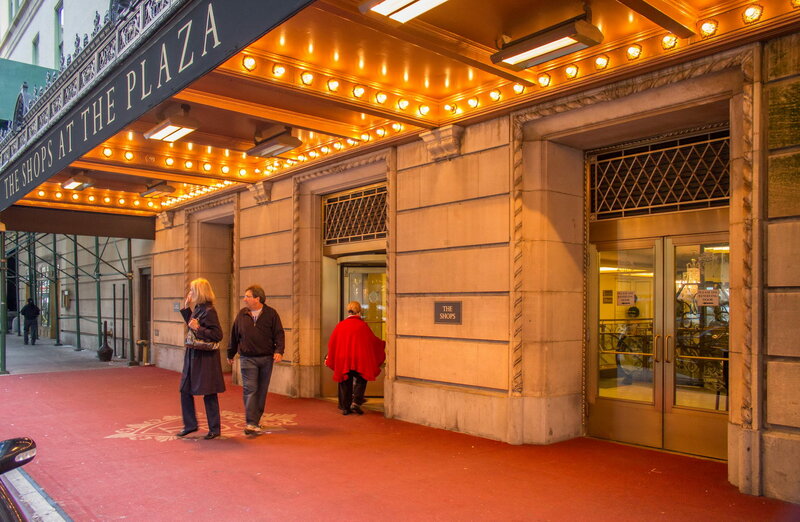 As such, the Plaza has accumulated a history that is both educational and entertaining. 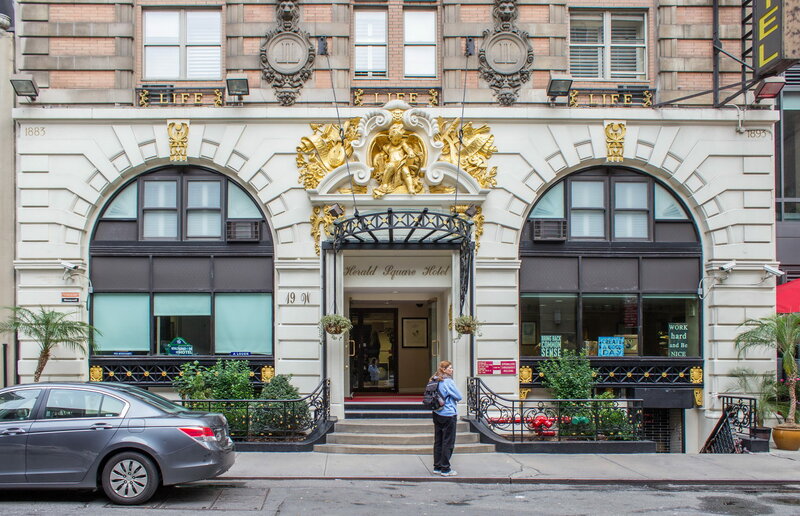 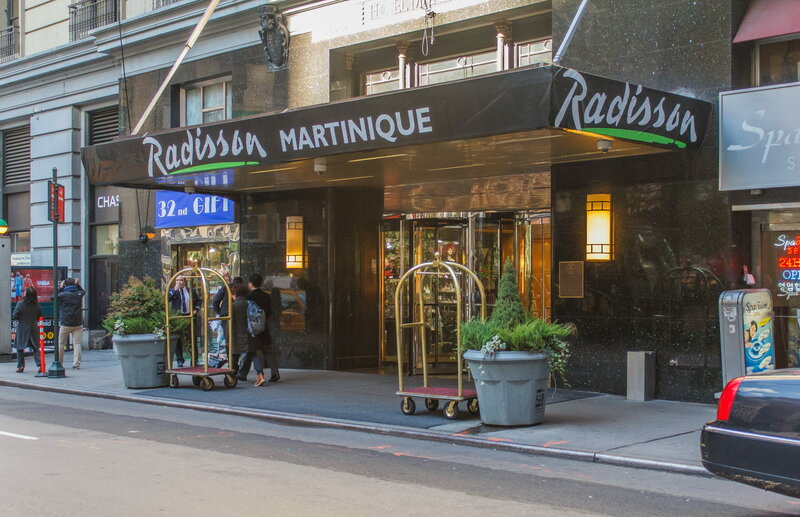 The NYC Landmarks Preservation Commission designation report for the hotel’s interiors is a rich narrative about the hotel, its owners, architects, renovations and occupants. 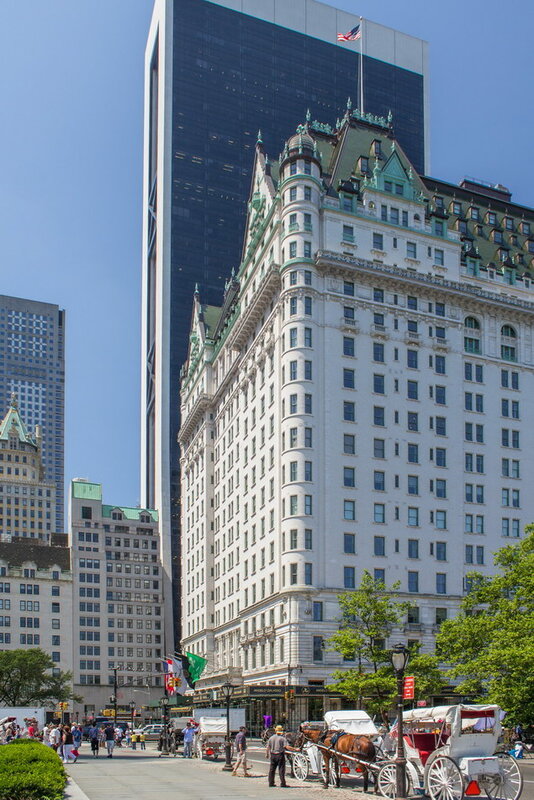 The Wikipedia entry adds more popular details, such as the movies and television shows in which the Plaza has appeared. 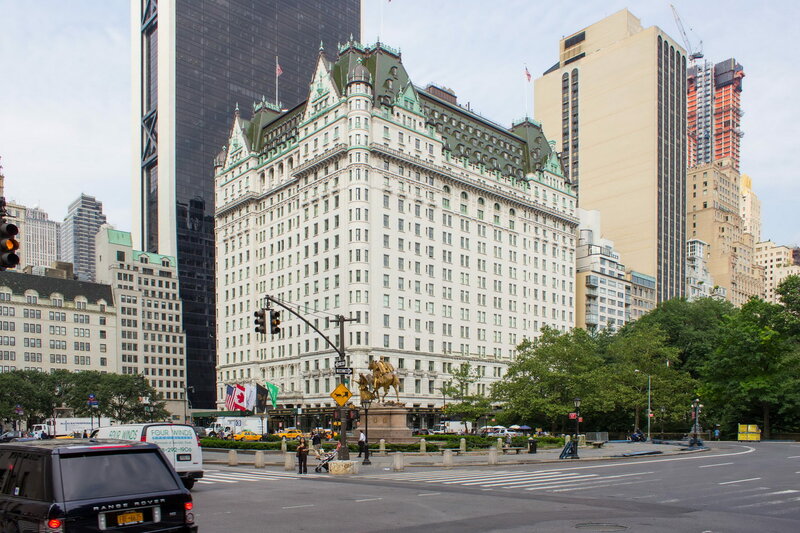 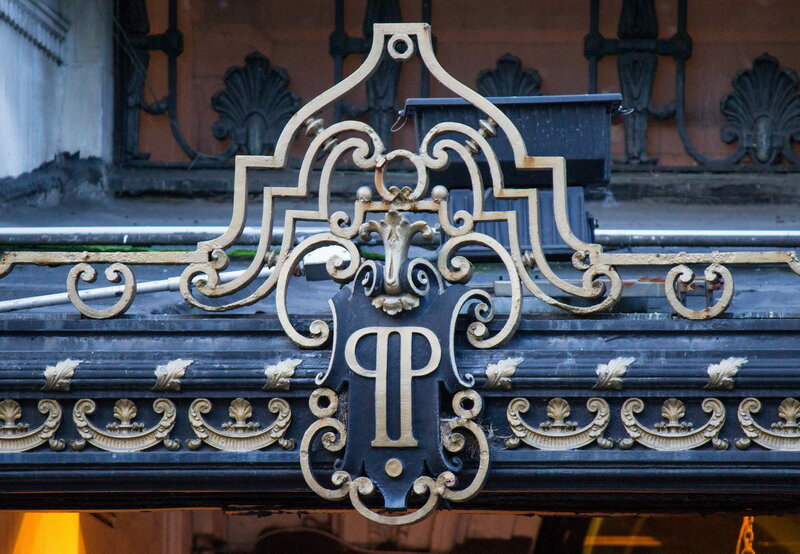 Trivia buffs, add this to your repertoire: The current property is the second Plaza Hotel on this site; the first hotel (also considered among the finest in New York) was demolished after 15 years to make way for an even grander property. 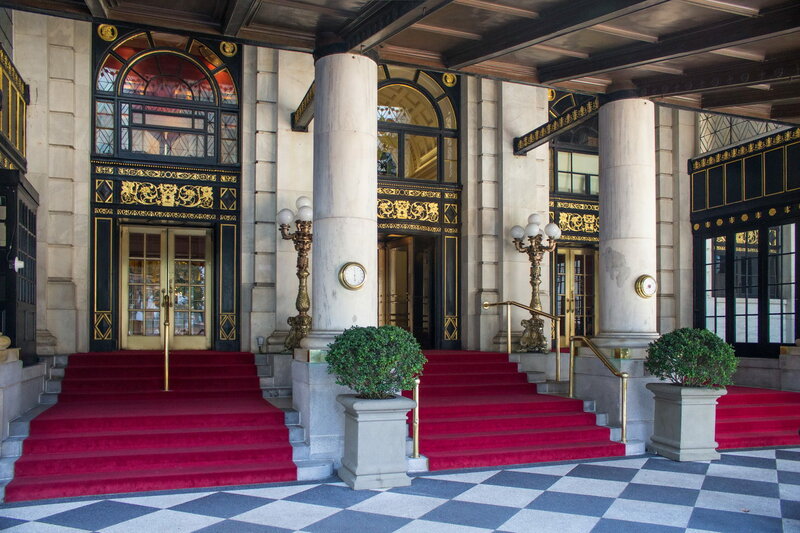 Also: Fairmont Hotels & Resorts manages the Plaza – and also Boston’s Fairmont Copley Plaza – which was also designed by Henry Janeway Hardenbergh. 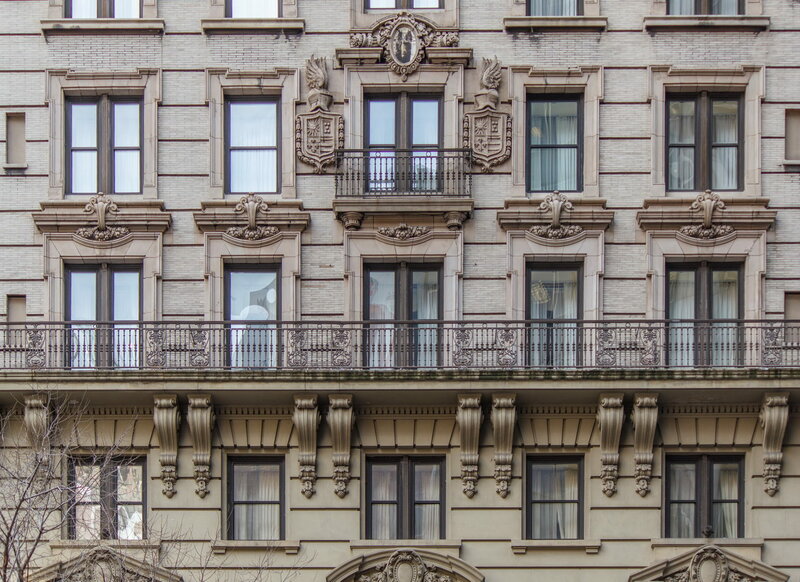 Hardenbergh also designed the Dakota Apartments, the Western Union Telegraph Company Building, and the Schermerhorn Building in New York. 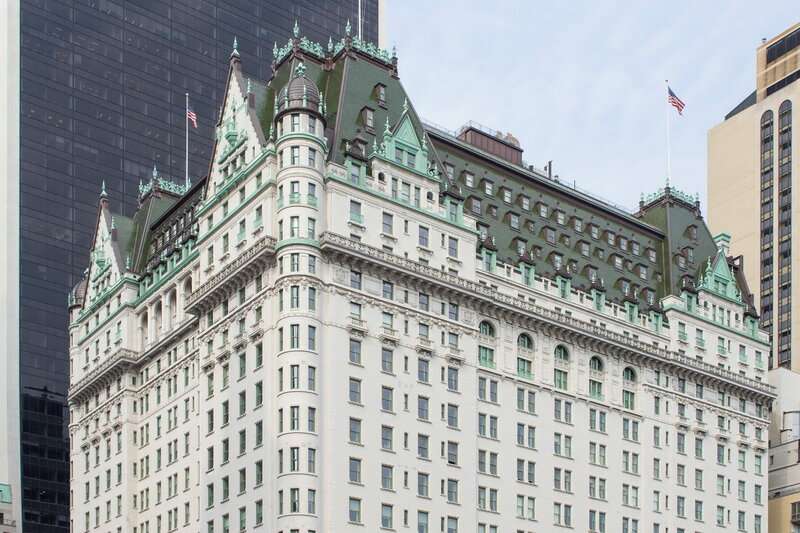 He designed the Waldorf and Astoria Hotels (then located at Fifth Avenue from 33rd to 34th Streets), among other prominent buildings now demolished. 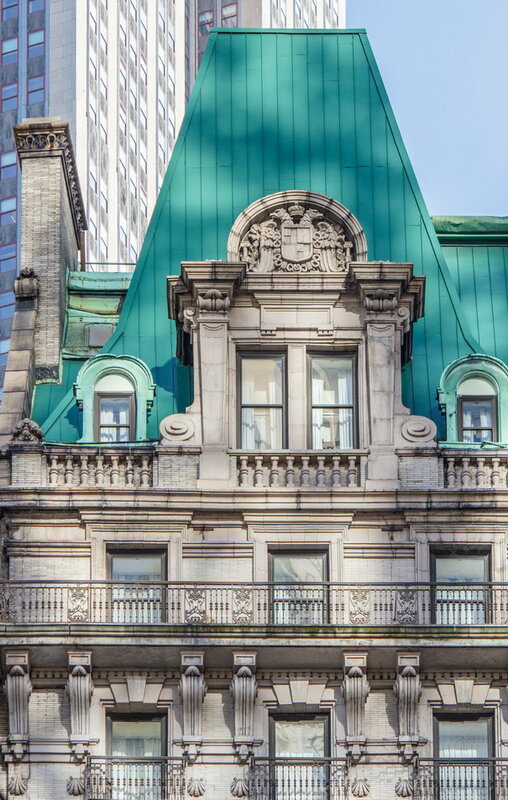 February 23, 2015 Manhattan1904, 4 W 31st Street, beaux arts, hotel, John H. Duncan, landmark, Manhattan, midtown, New York City. 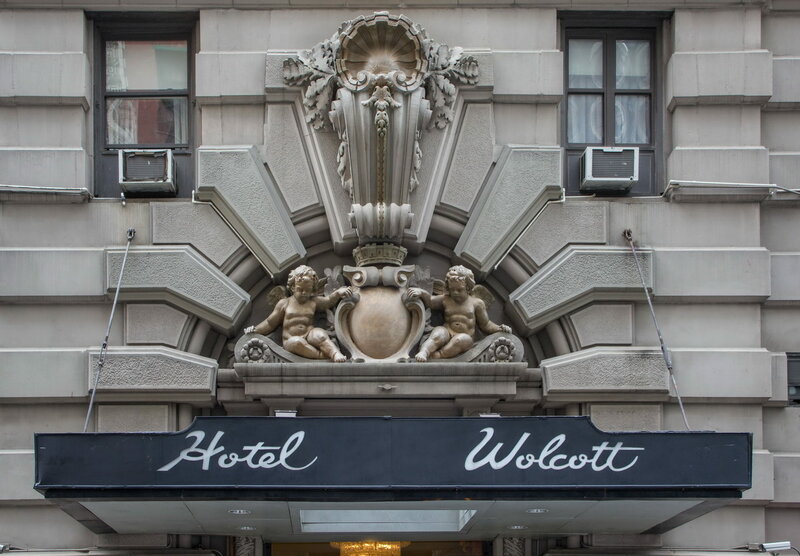 Hotel Wolcott was built at the time when Herald Square was becoming New York’s “center of gravity” for entertainment, shopping, restaurants and hotels. 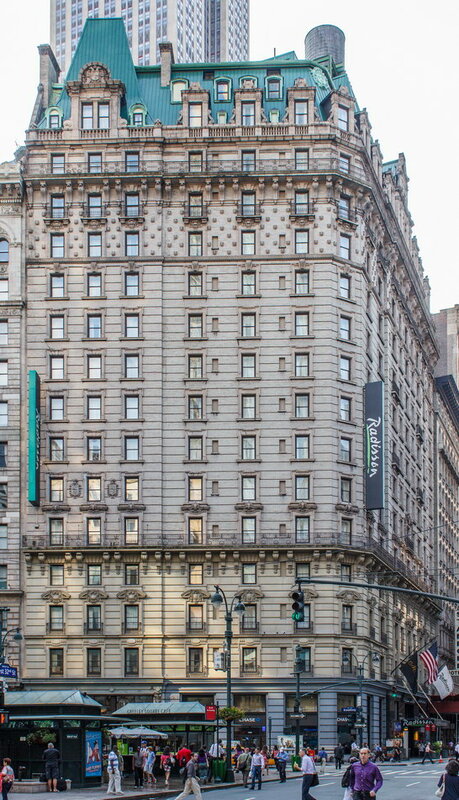 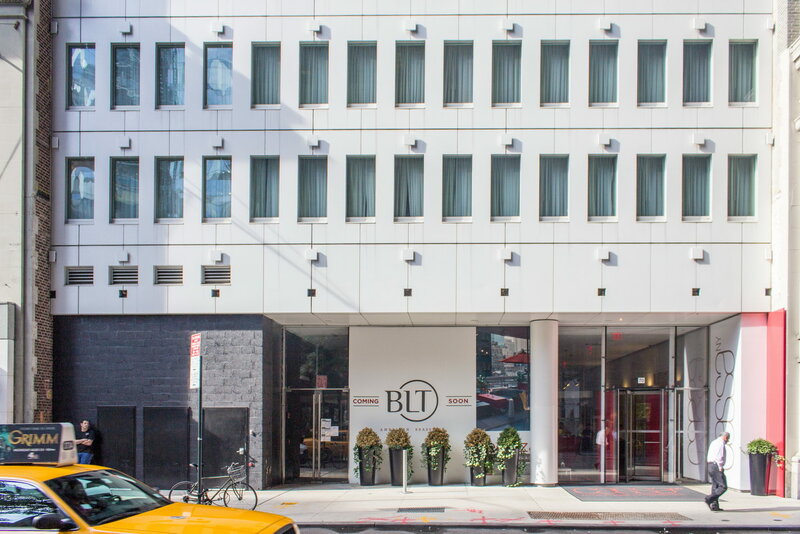 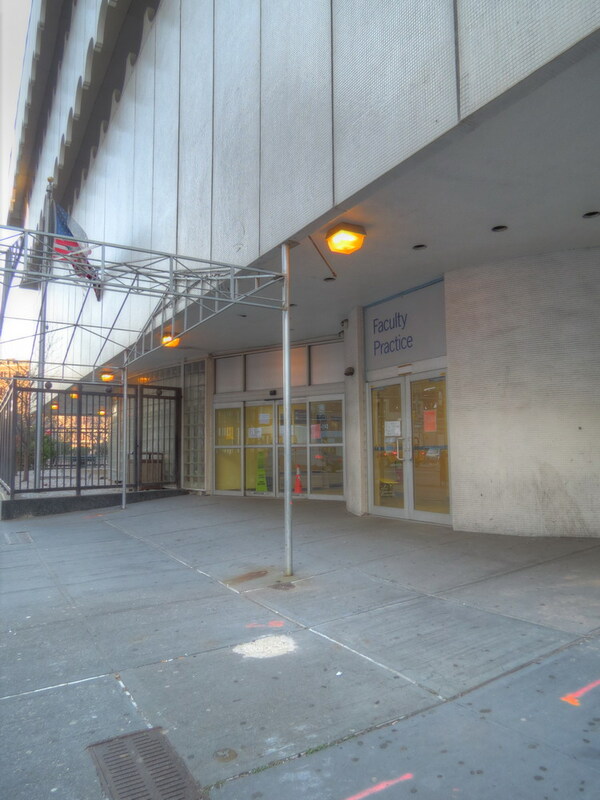 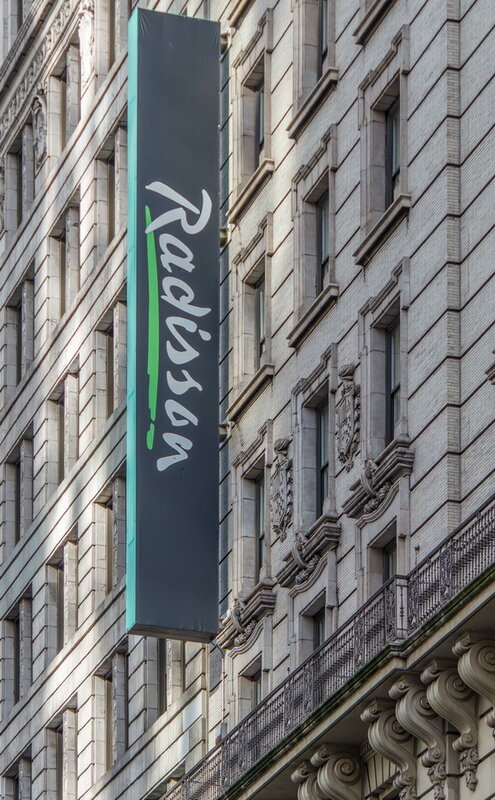 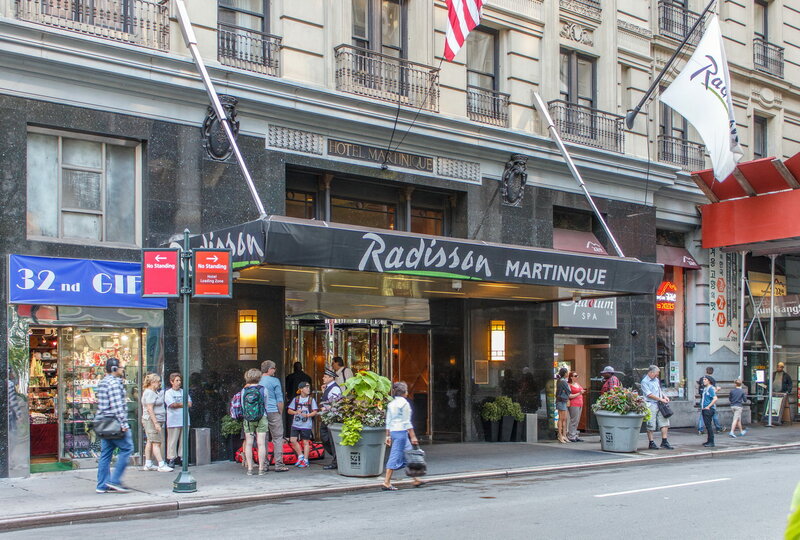 While some prominent hotels were built on the avenues – Fifth Avenue and Broadway – mid-block properties offered quieter ambience without sacrificing convenience. 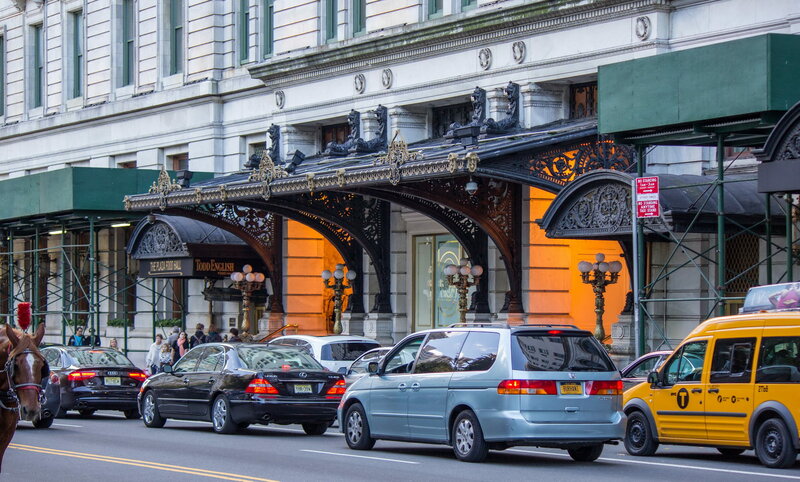 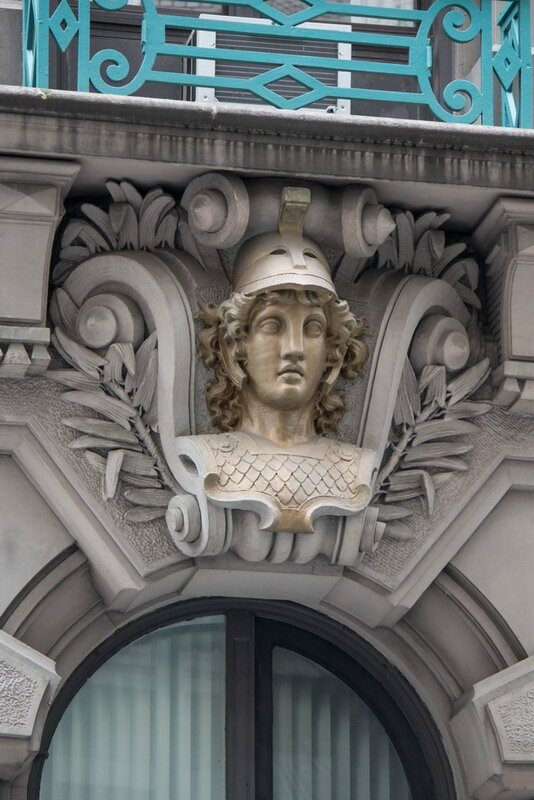 The Beaux Arts/Second Empire style was adopted for many hotels of the period. 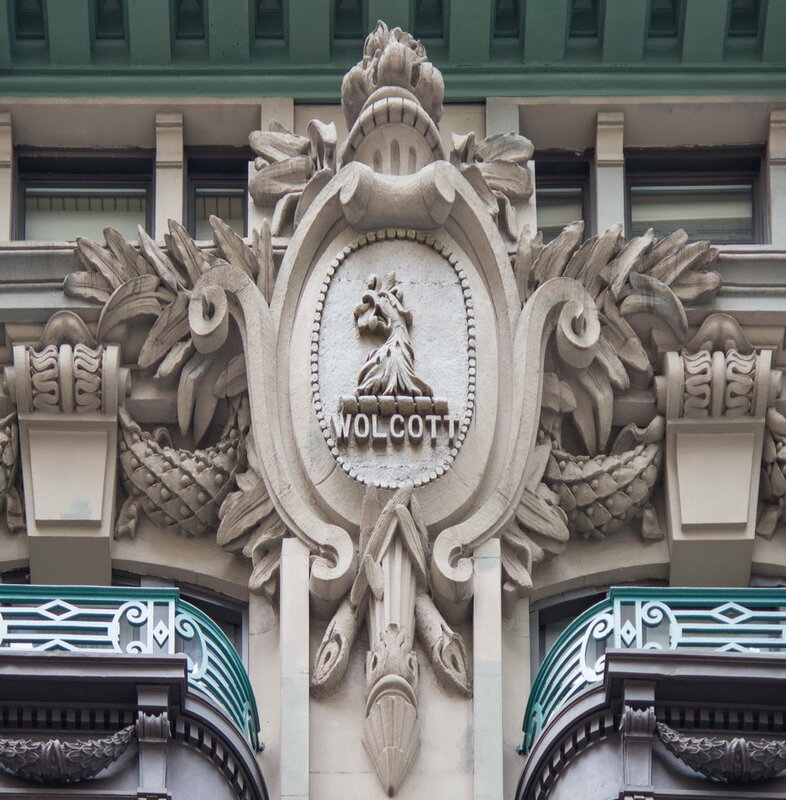 However, architect John H. Duncan designed Hotel Wolcott with oversized, flamboyant decoration to make it stand out on the mid-block location and to be unique among competitors. 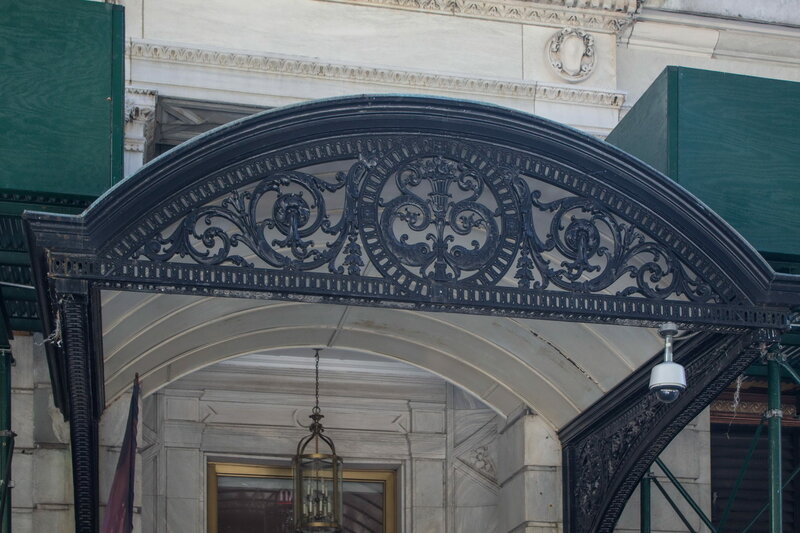 John H. Duncan designed several NYC landmarks, the best-known of which are the General Ulysses S. Grant National Memorial (Grant’s Tomb) and the Soldiers’ and Sailors’ Memorial Arch in Grand Army Plaza, Brooklyn. 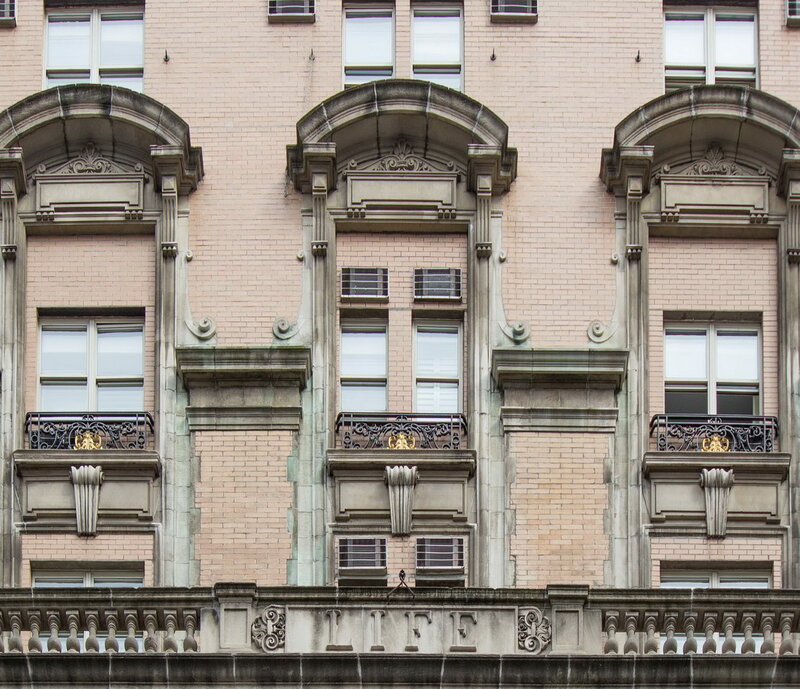 February 23, 2015 Manhattan19 W 31st Street, 1900, beaux arts, Carrere & Hastings, historic, hotel, Life Magazine, Manhattan, midtown, New York City. 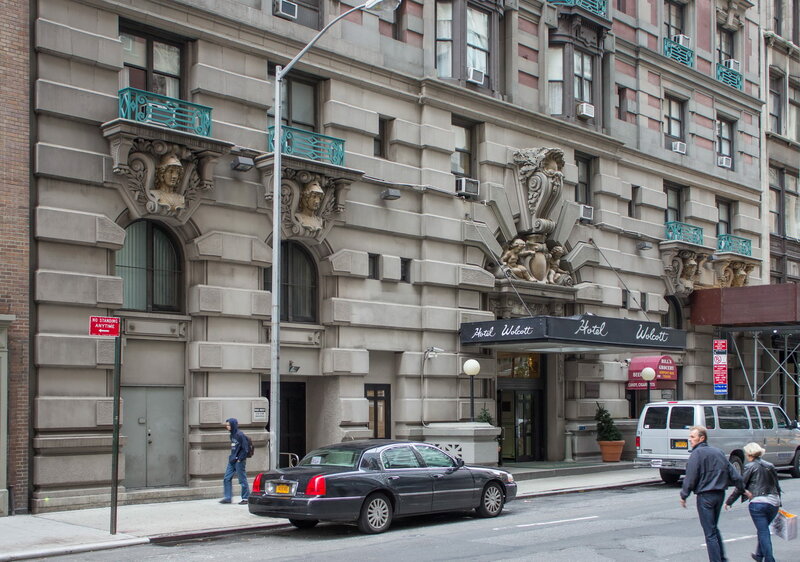 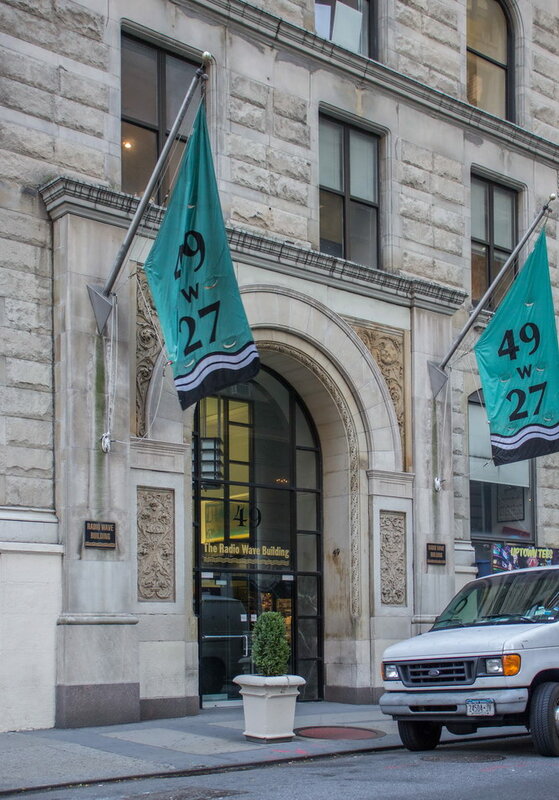 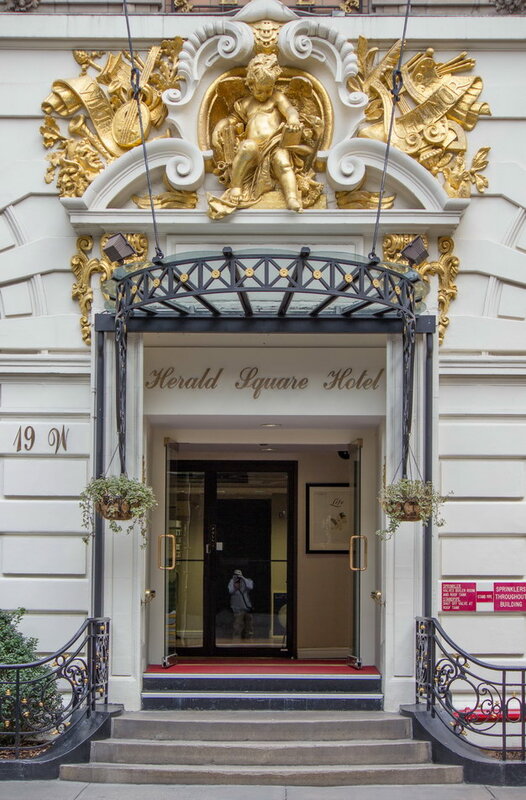 Herald Square Hotel, though grossly altered, remains a bright spot on West 31st Street – just across the street and down the block from the larger Hotel Wolcott. 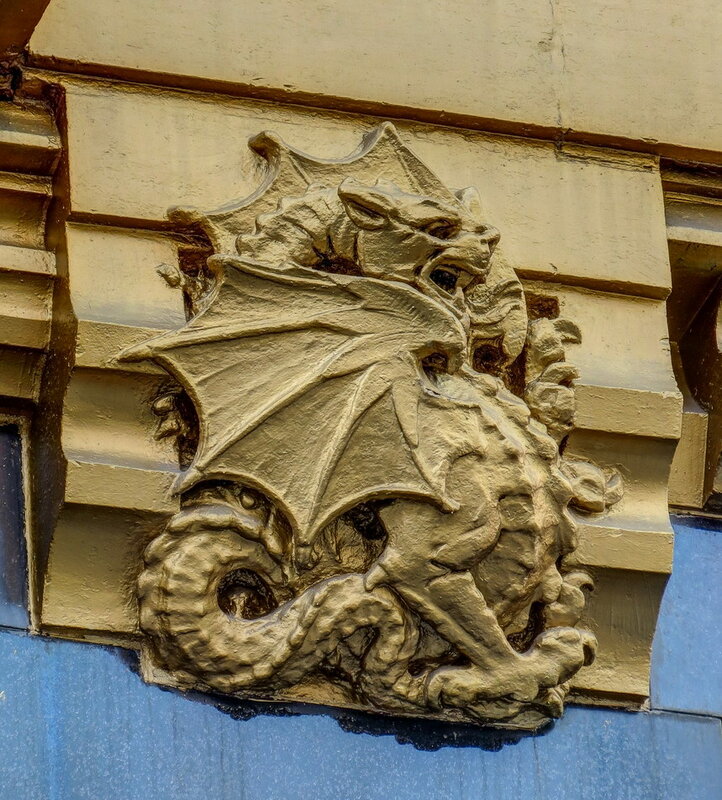 It’s also where some fascinating histories intersect. 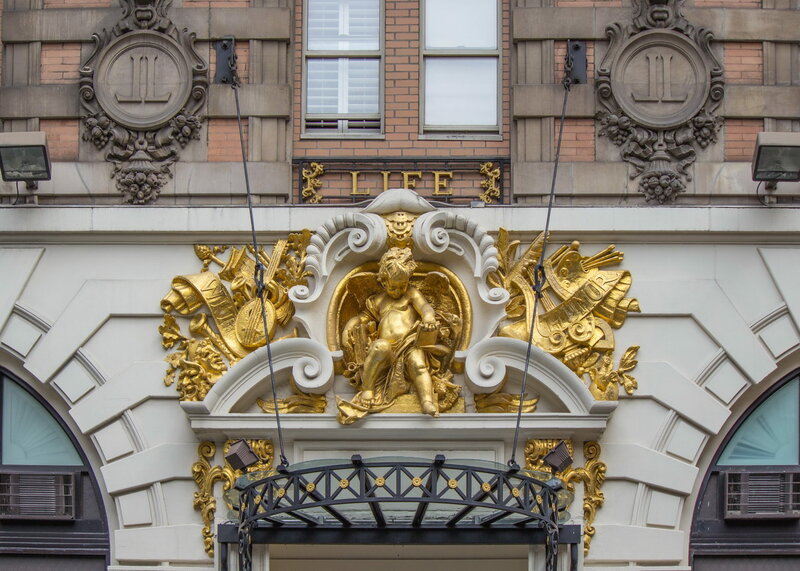 The building, designed by Carrère & Hastings, was erected as the home of Life magazine in 1900. 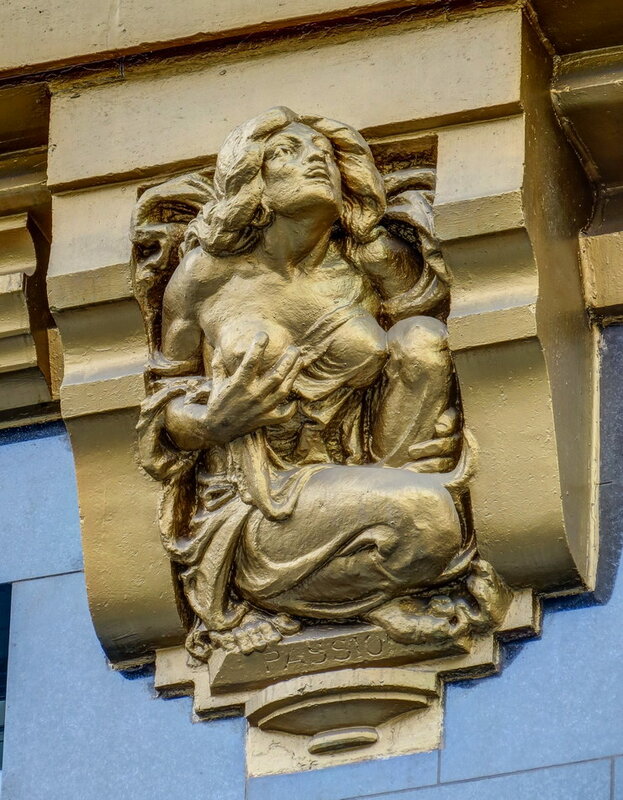 At the time, Life was the upscale humor magazine that discovered Charles Dana Gibson, the artist behind the famous “Gibson Girls.” Other contributors included Robert “Believe It Or Not!” Ripley and Norman Rockwell. 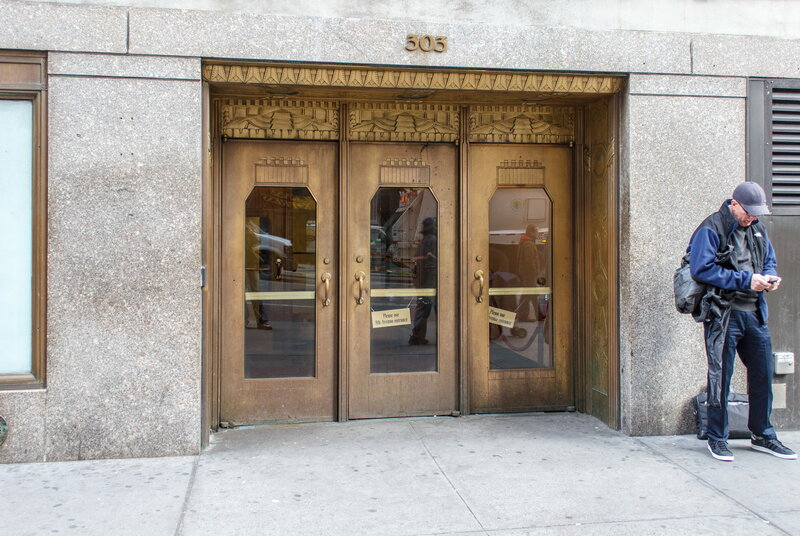 Gibson had a studio in the building, and took over Life magazine after John Mitchell, one of the founders, died in 1918. 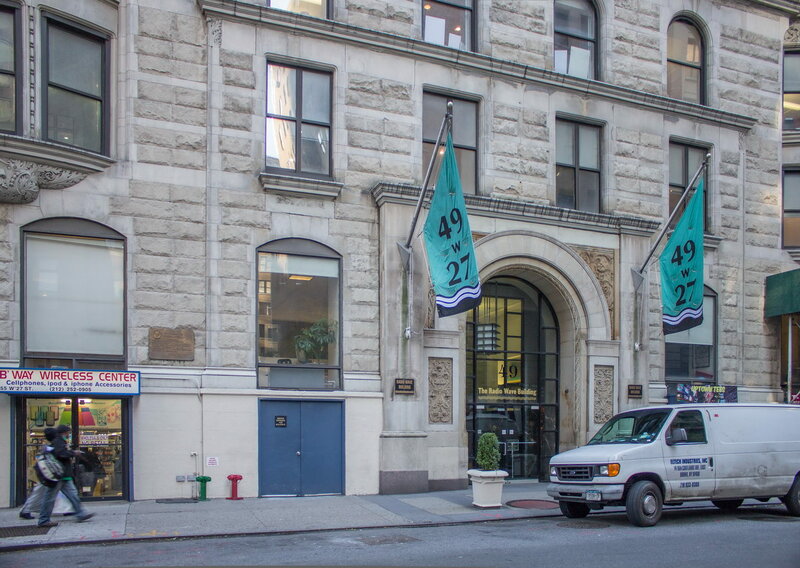 The magazine went into decline, and was forced to sell the building. 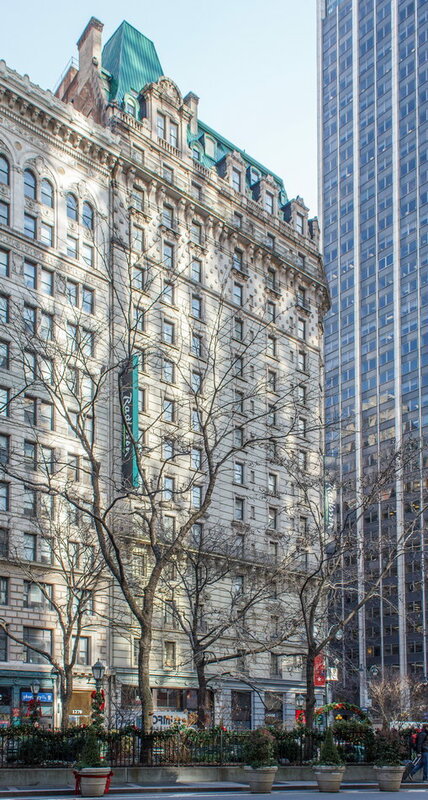 Ultimately Henry Luce bought Life for its name. 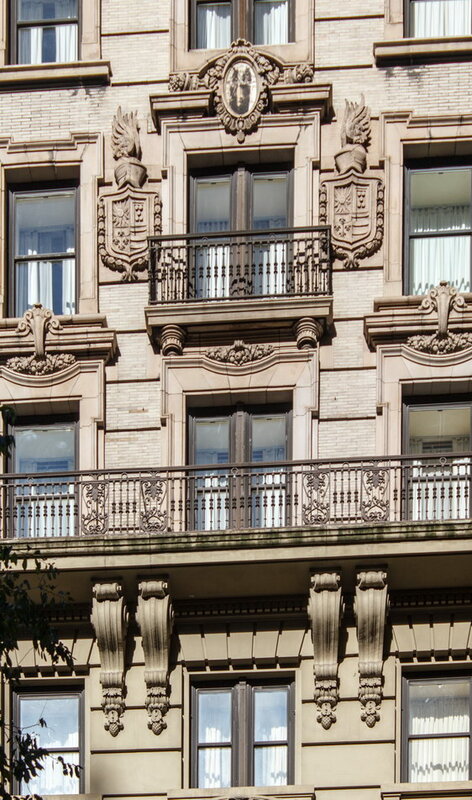 The building was converted to an apartment hotel in 1937 and has changed hands several times. 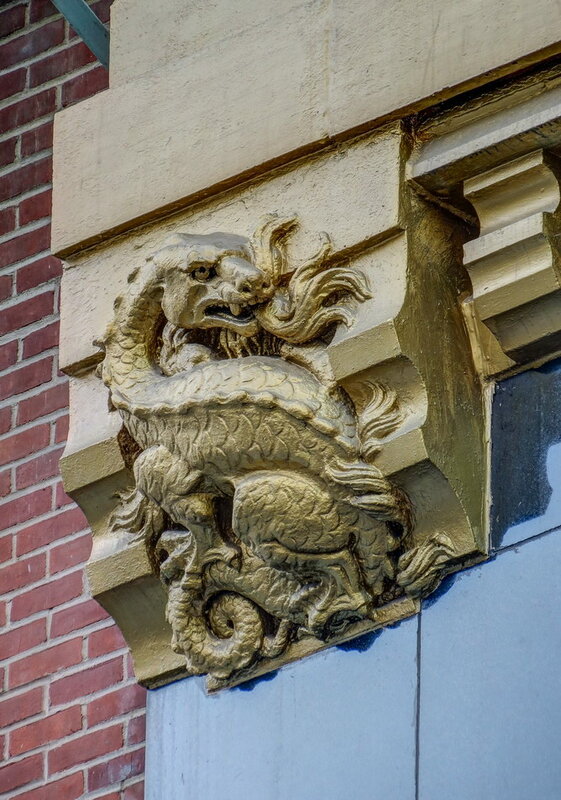 It was purchased by the Puchall family in 1970, and restored over the years. 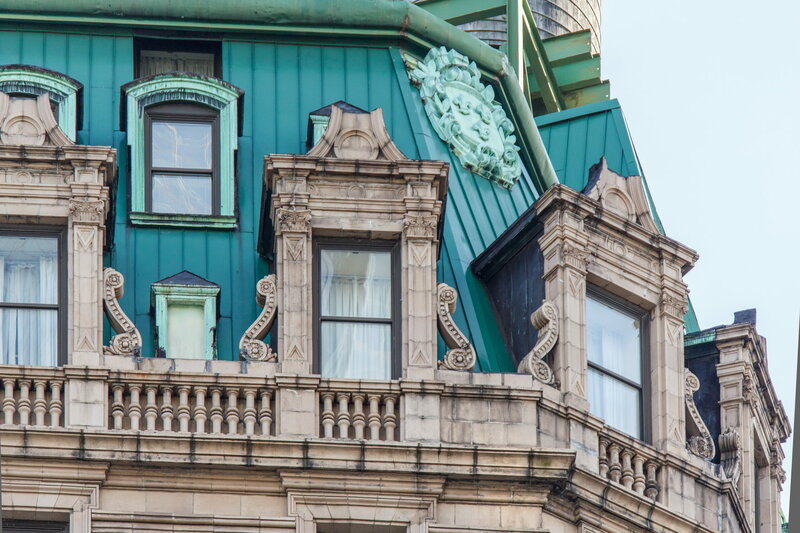 However, the family made drastic alterations to the top floors in 1995, eliminating the mansard roof. 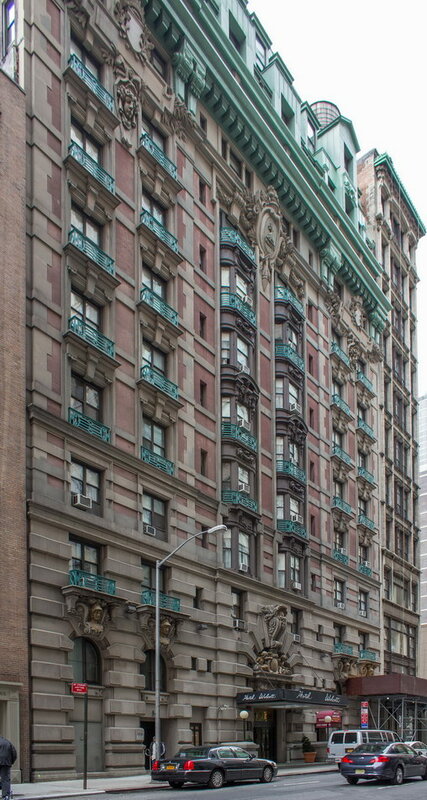 February 23, 2015 Manhattan1883, 49 W 27th Street, August Hatfield, historic, hotel, landmark, Manhattan, midtown, New York City, Queen Anne. 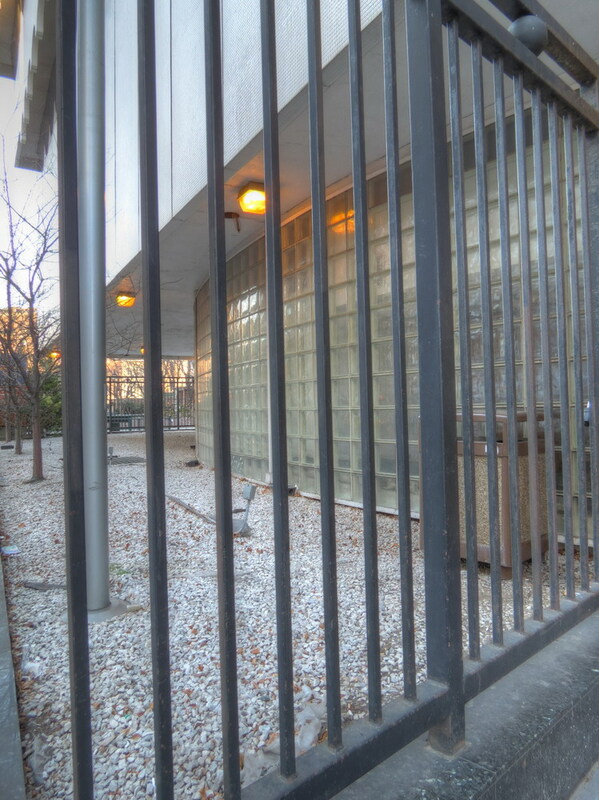 The Yugoslav-American Bicentennial Committee placed a plaque on the building to commemorate Tesla on Jan. 7, 1977 – the anniversary of Tesla’s death. 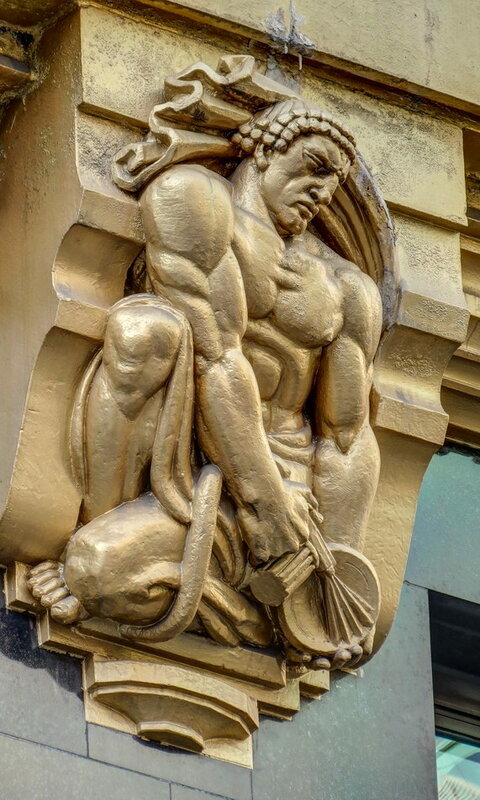 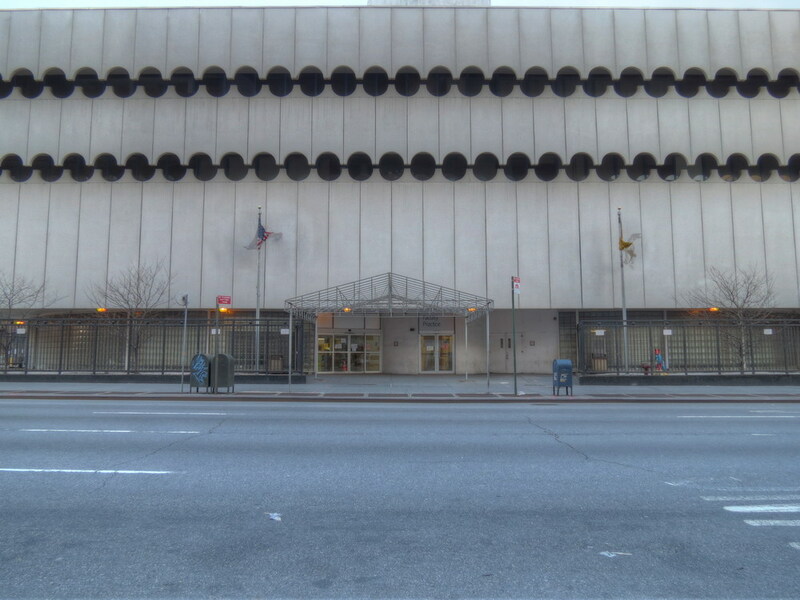 But the building has a more fitting memorial that would make Nikola smile: A ground-floor tenant is Broadway Wireless Center, whose window is lit in neon and florescent tubes. 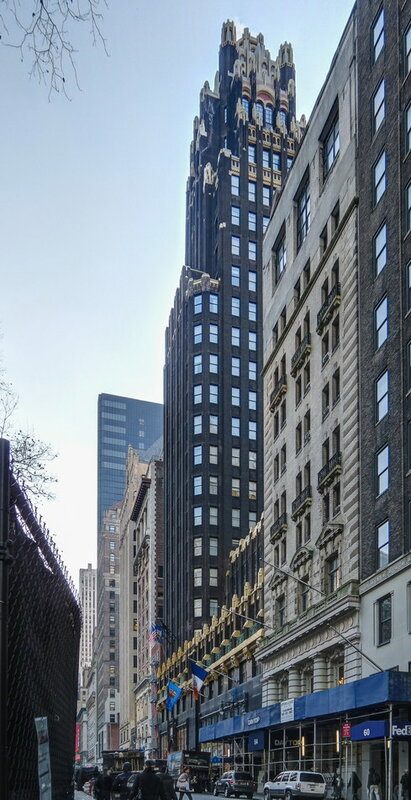 Nikola Tesla has several other memorials in midtown. 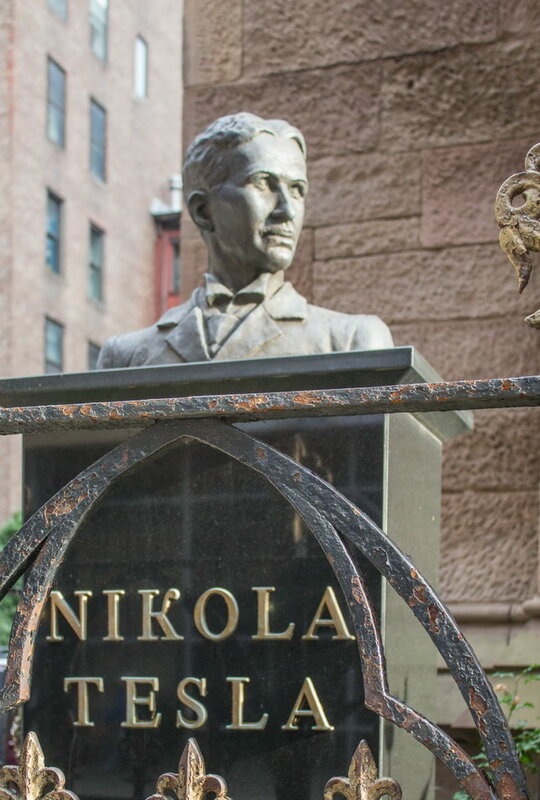 A bust of Nikola Tesla was erected at the Serbian Orthodox Cathedral of St. Sava, two blocks south of the Radio Wave Building. 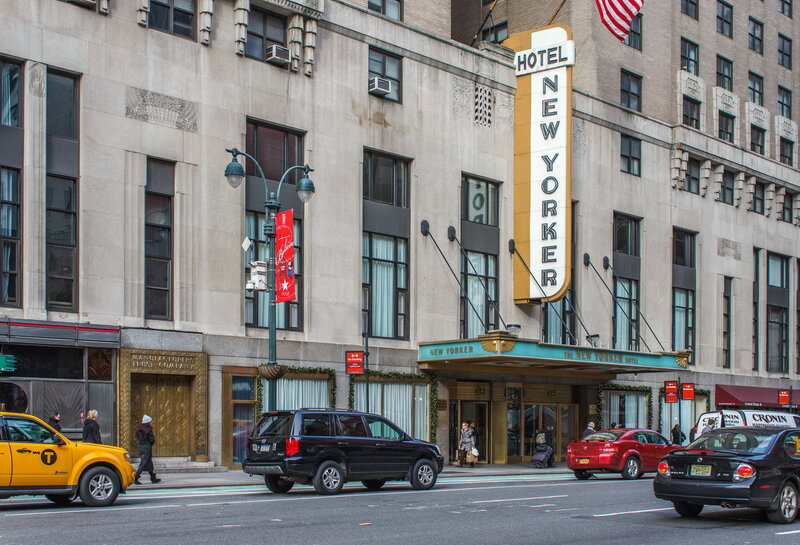 There’s another memorial plaque on the Hotel New Yorker (W34th Street at Eighth Avenue), where Tesla lived for 10 years – and died. 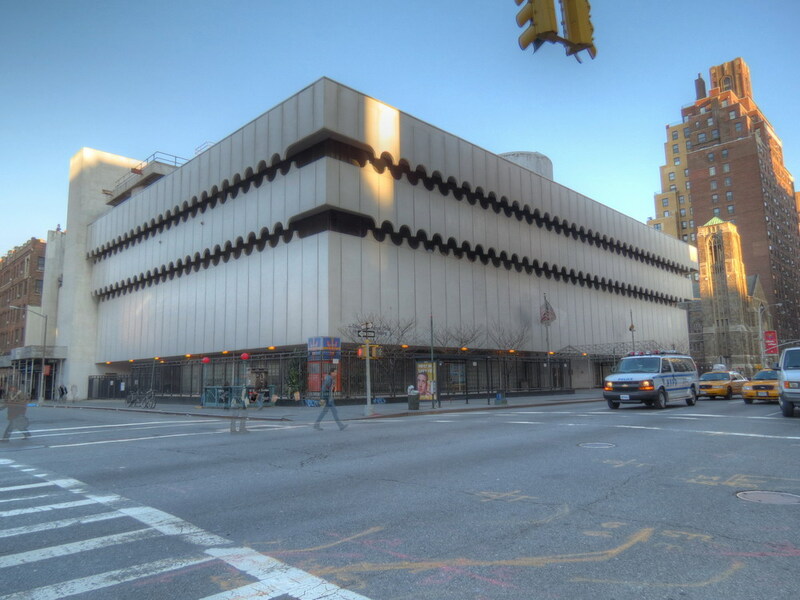 And there’s a “Tesla Corner” at Sixth Avenue and W40th Street, where Nikola liked to feed the pigeons. 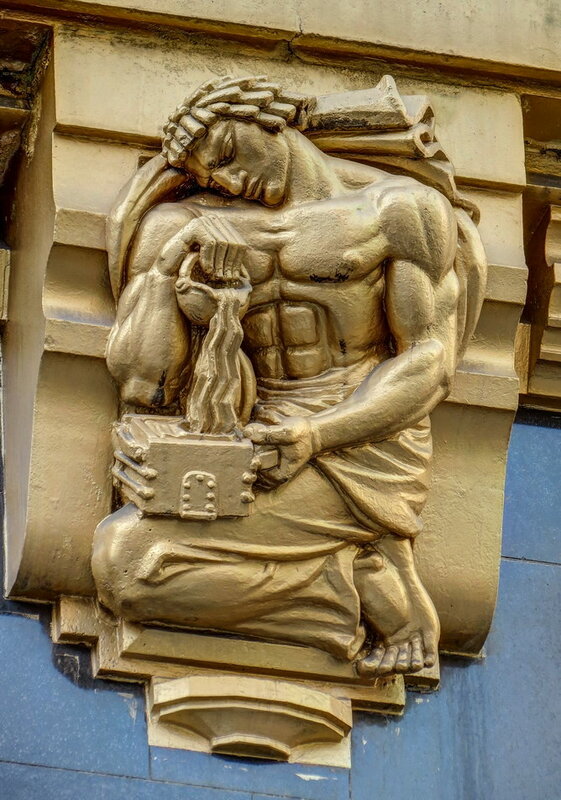 Nikola Tesla had a fascinating – though often tragic – life. 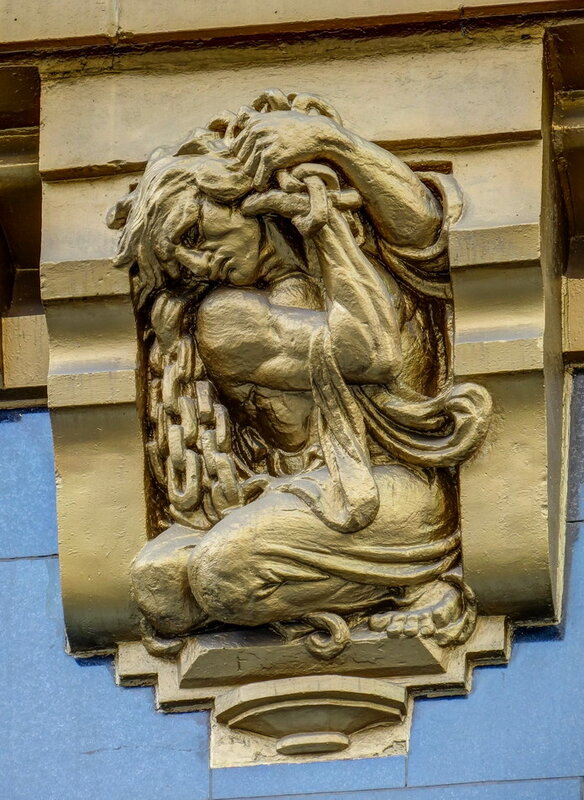 Follow the Tesla links below to learn more. 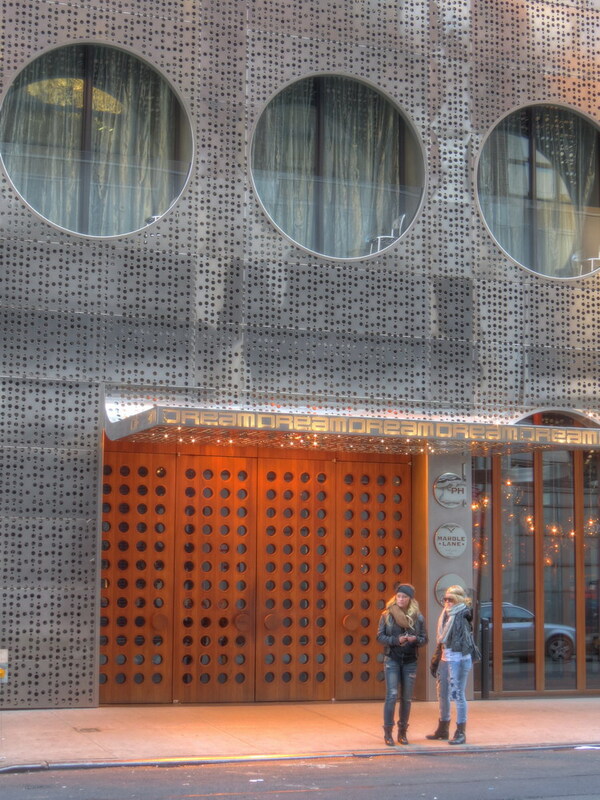 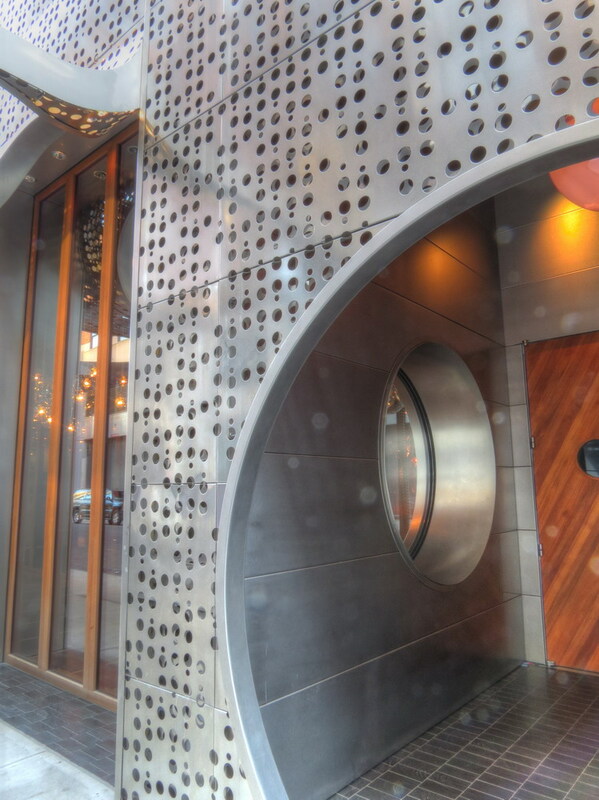 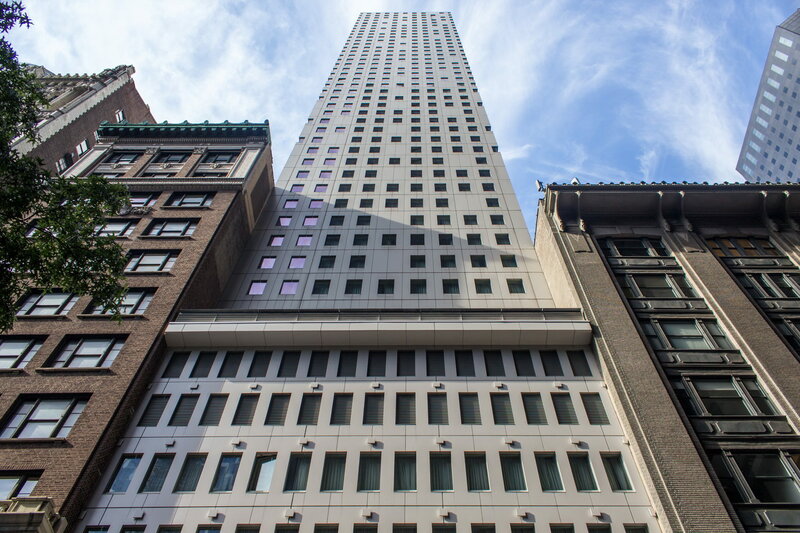 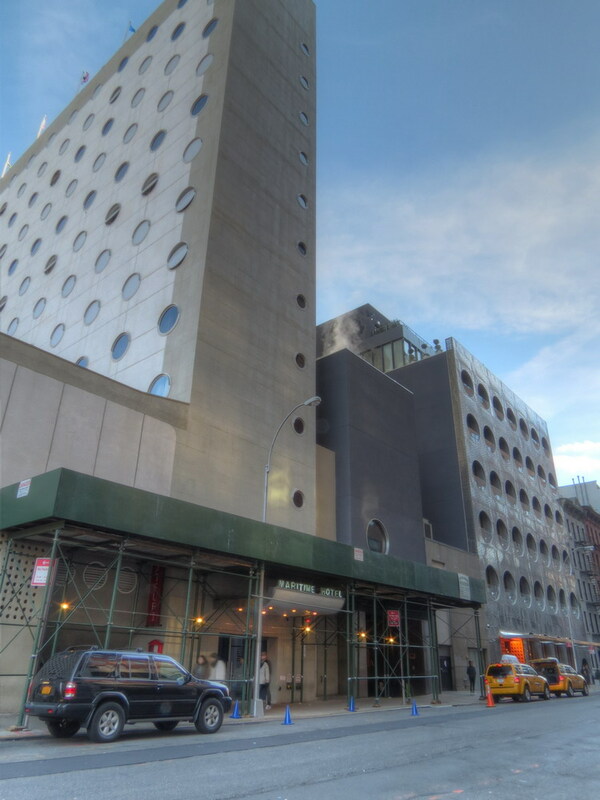 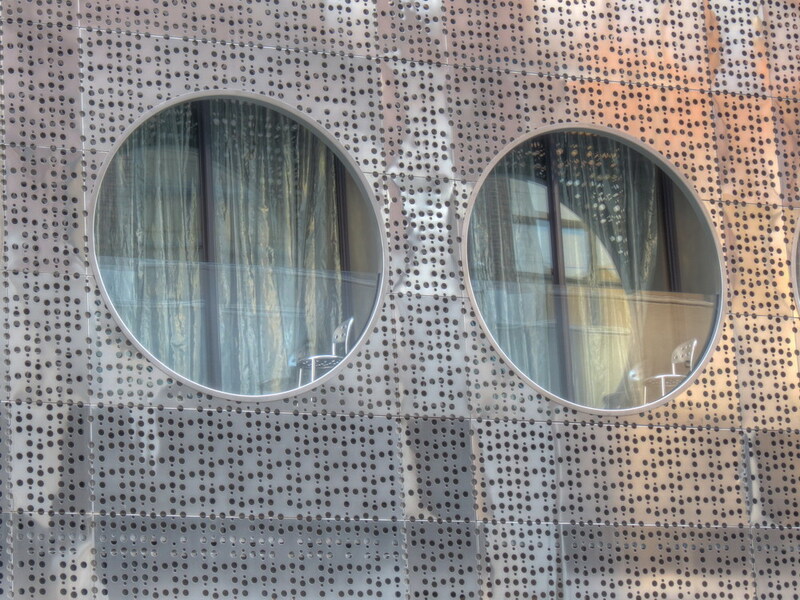 February 22, 2015 Manhattan2010, 70 W 45th Street, hotel, Manhattan, midtown, New York City, postmodern, residential, TEN Arquitectos. 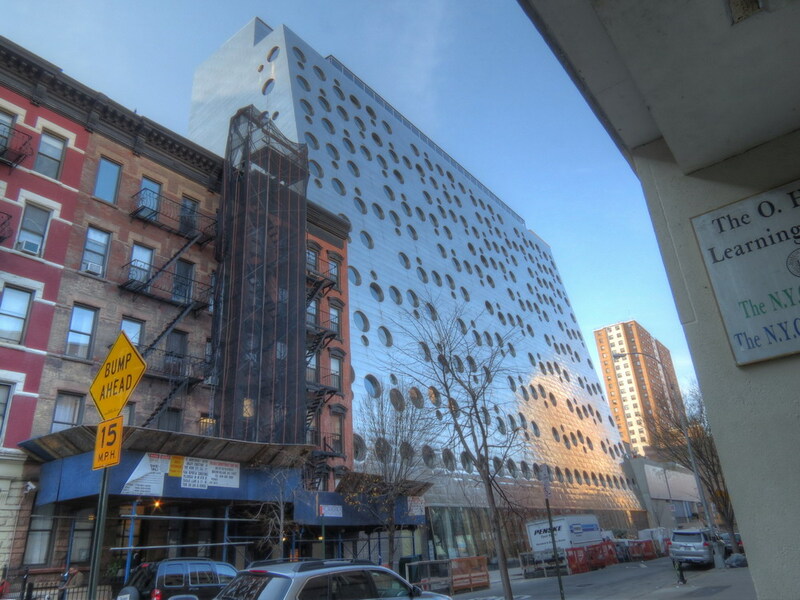 Cassa NY is a slender white hotel/condominium tower that might remind you of those computer punch cards of the 1960s – rectangular windows appear to have been punched right out of the aluminum skin. 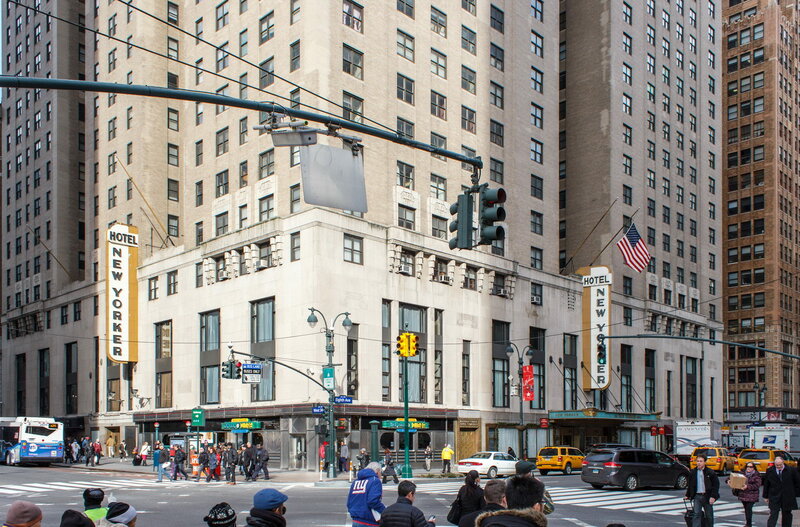 February 22, 2015 Manhattan1930, 481 Eighth Avenue, Art Deco, hotel, Manhattan, midtown, New York City, Sugarman and Berger. 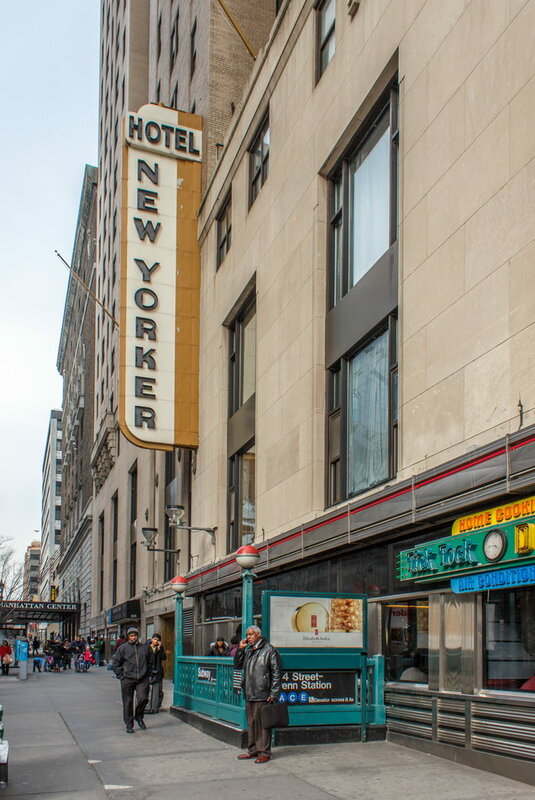 New Yorker Hotel was once an elegant celebrity-studded 2,500-room property – New York City’s largest when it opened in 1930. 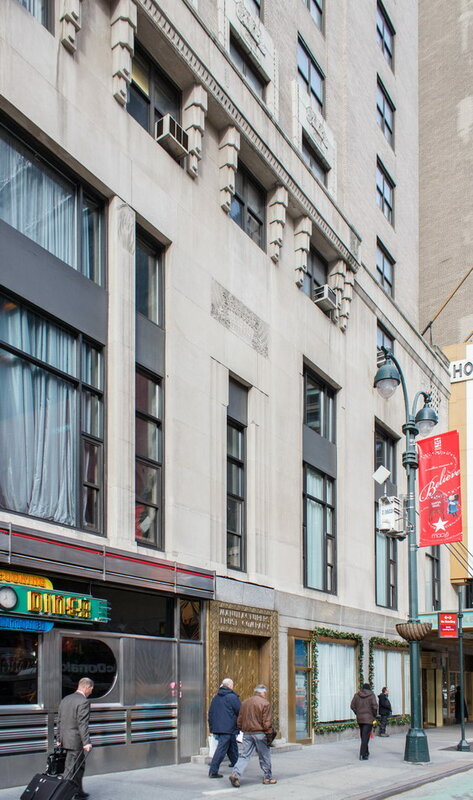 Convenient to Pennsylvania Station, it boasted five restaurants, a 42-chair barbershop, and platoons of snappily-uniformed bellboys. 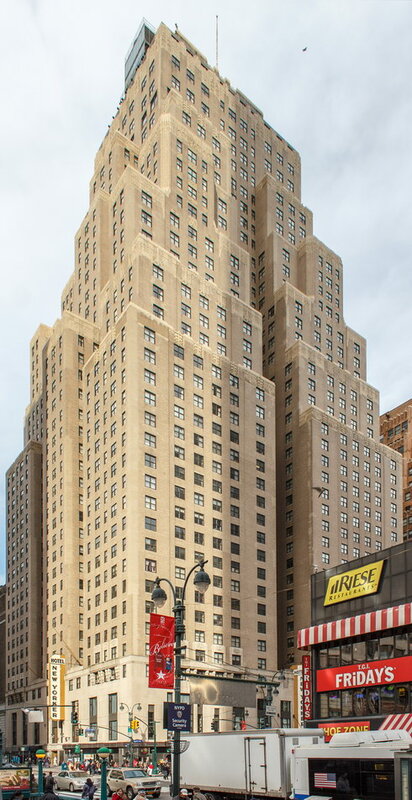 Architecturally, the 43-floor Art Deco tower was (and is) quite plain; apart from size and shape, the building’s most prominent feature is the four-story, west-facing red “NEW YORKER” sign in the crown. 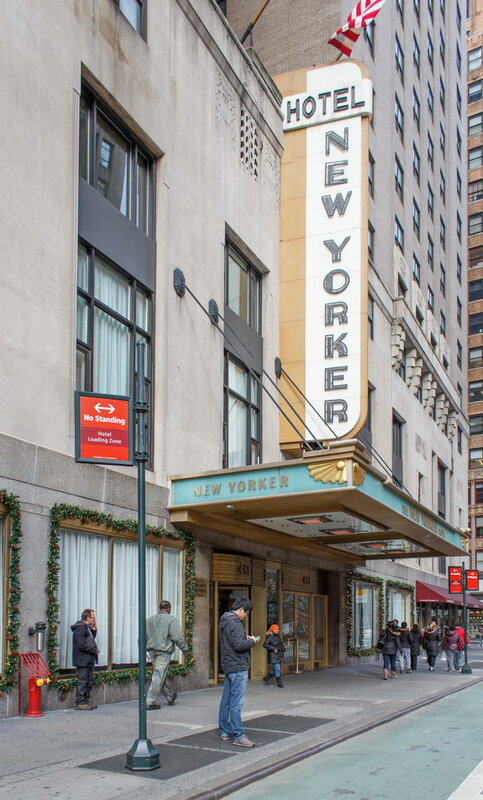 As the big-band era faded, so did New Yorker’s glitter; by the 1960s the hotel (then owned by Hilton) was in decline, financially, and closed in 1972. 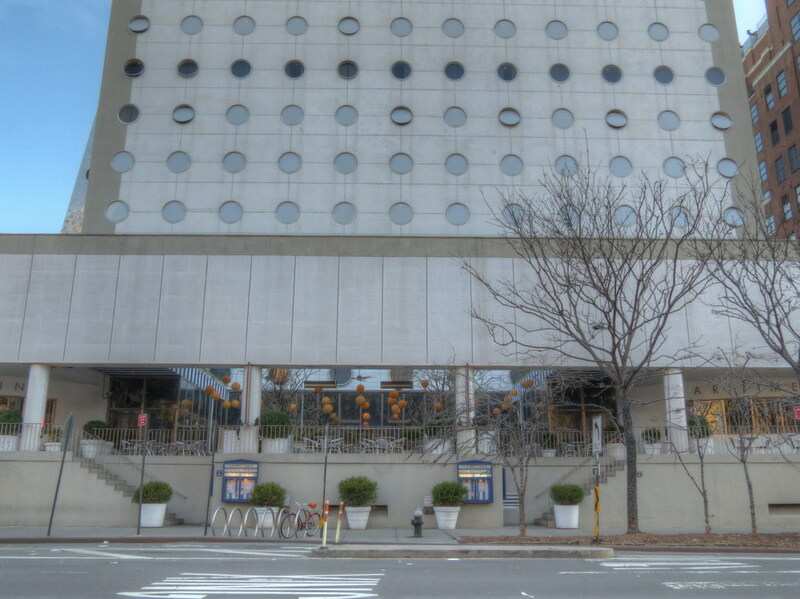 The World Unification Church (Rev. 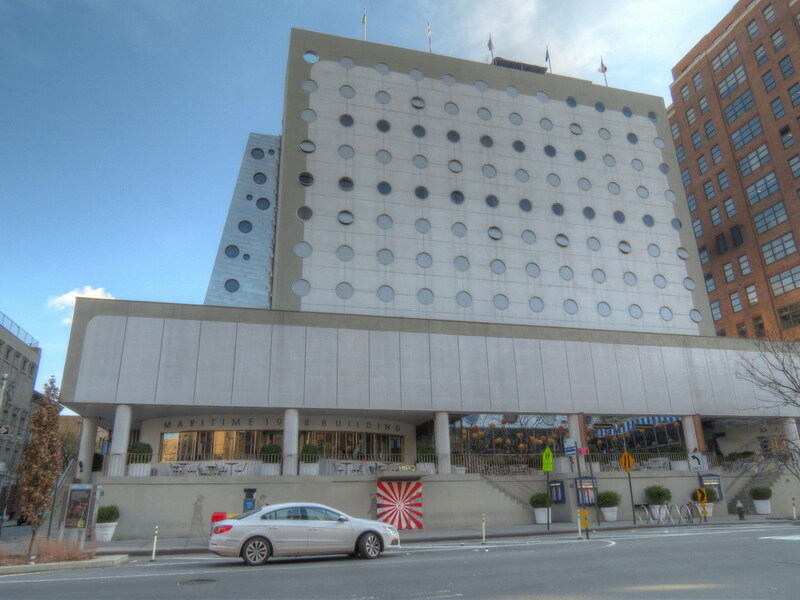 Sun Myung Moon) bought the hotel in 1975. 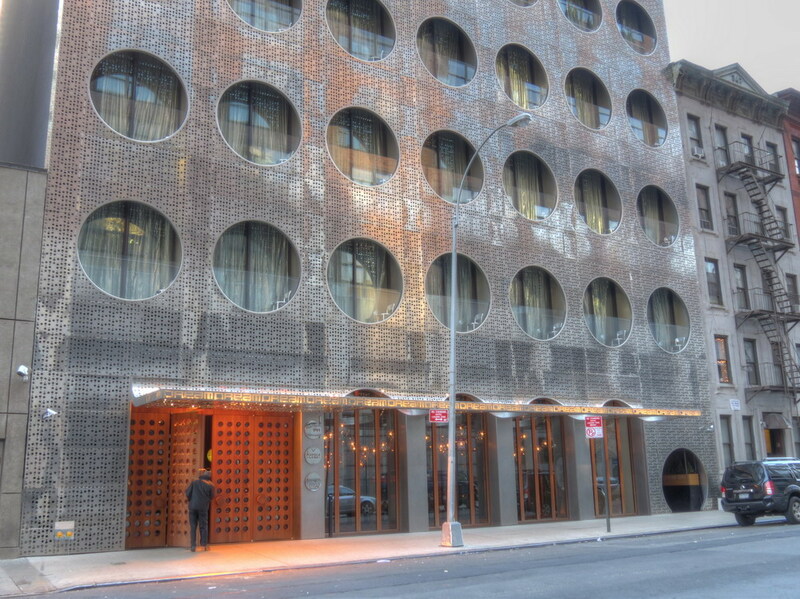 By 1994 the church decided to re-open the building as a hotel – starting with 178 rooms and a $20 million renovation. 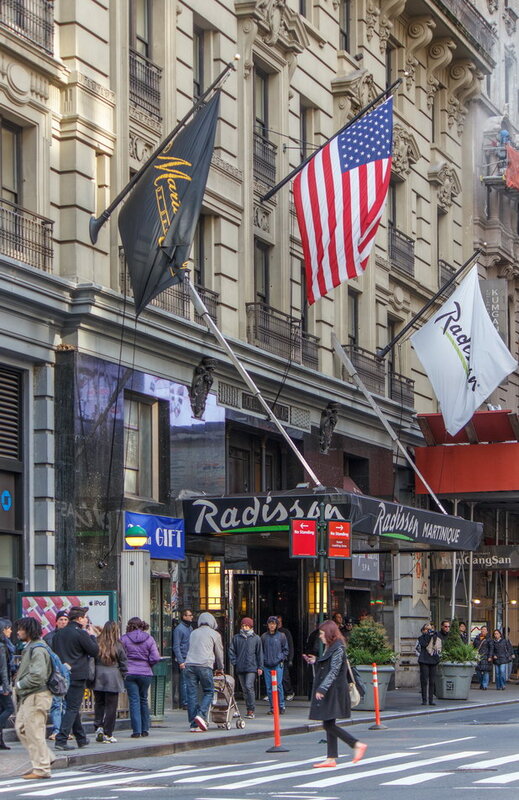 Ramada granted a franchise in 2000. 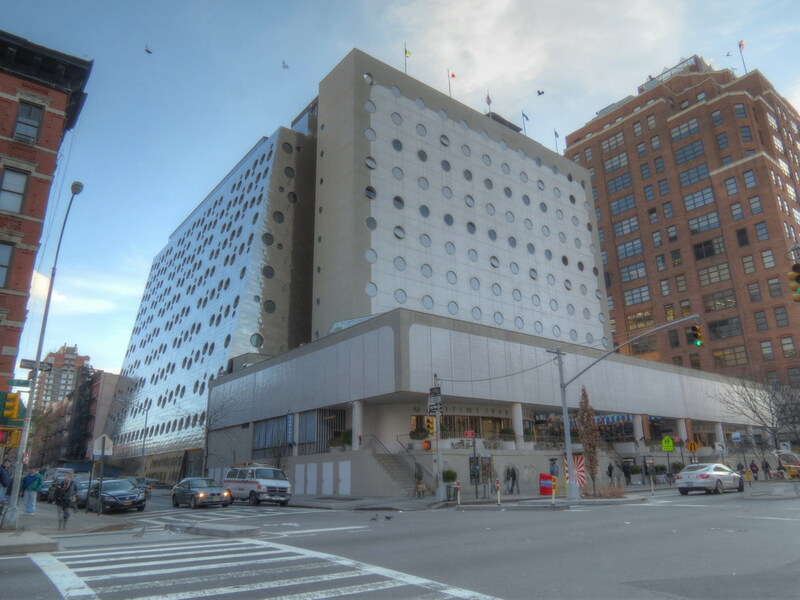 The hotel spent an additional $70 million on renovations 2007-2009; the property now has 900+ rooms on floors 19-40. 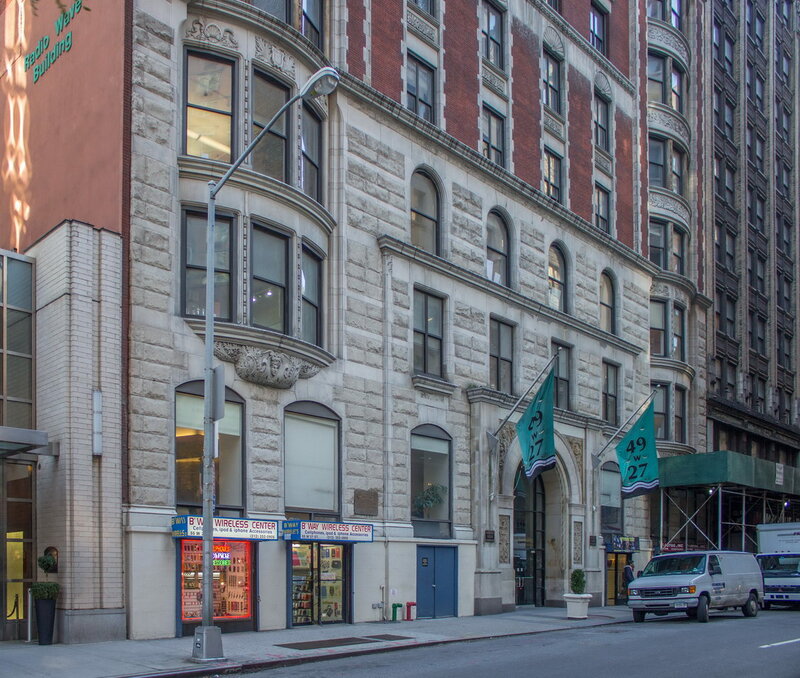 In addition, Educational Housing Services uses five floors (9, 14, 16, 17, 18) for student housing. 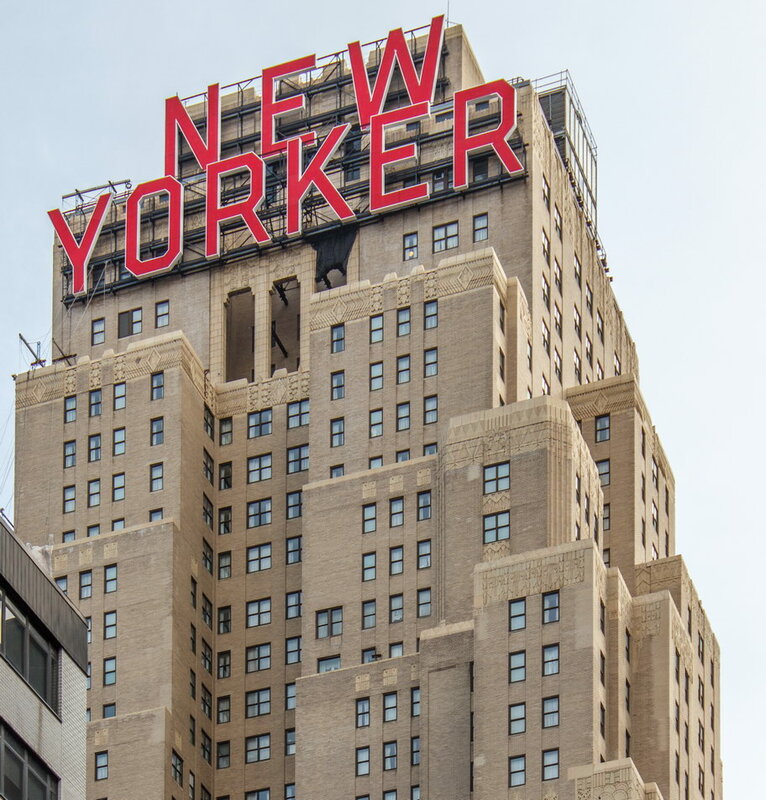 New Yorker Hotel’s architects, the firm of Sugarman and Berger, have several other prominent New York City buildings, including: Gramercy Arms Apartments, Broadway Fashion Building, One Fifth Avenue, Millennium Towers North/Navarro Building, Paris Hotel/Paris Apartments.